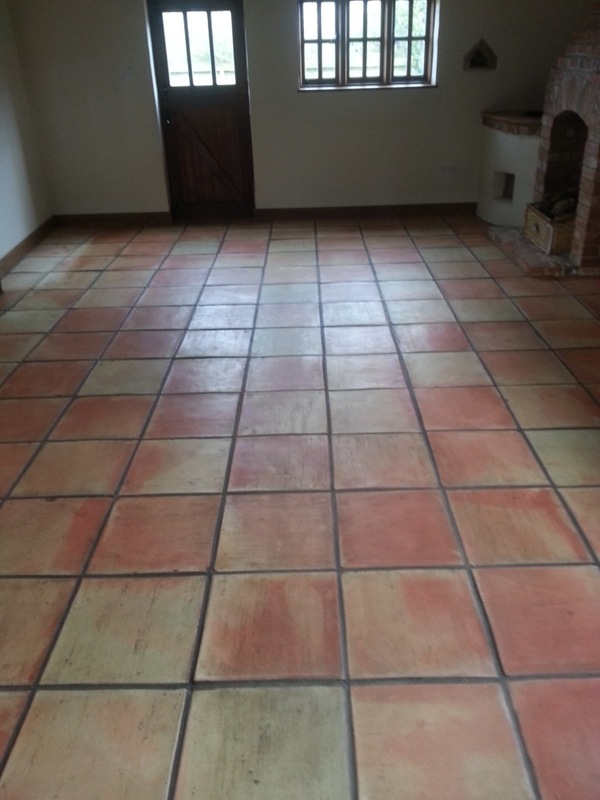 Mexico is known to produce some of the best quality Terracotta tiles, with the Saltillo region in the north-east of the country being particularly famous for its craftsman. People from countries all over the world import these tiles and use them in their houses to create fantastic, colourful floors. 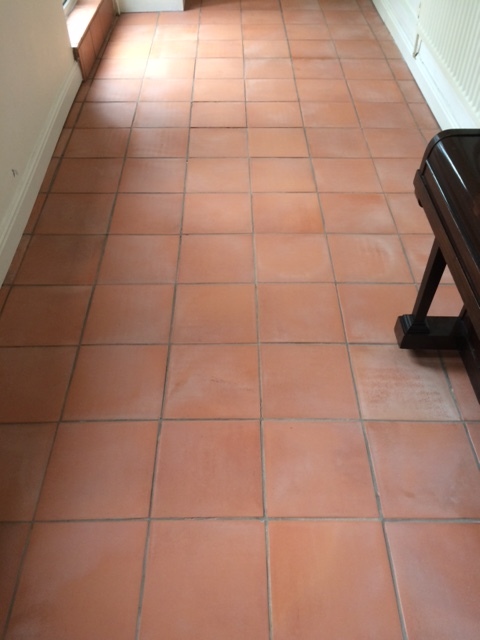 This set of Mexican Terracotta floor tiles had been installed throughout the ground floor of a property in historic Shrewsbury which is on the Welsh border and renowned for being the birthplace of Charles Darwin. 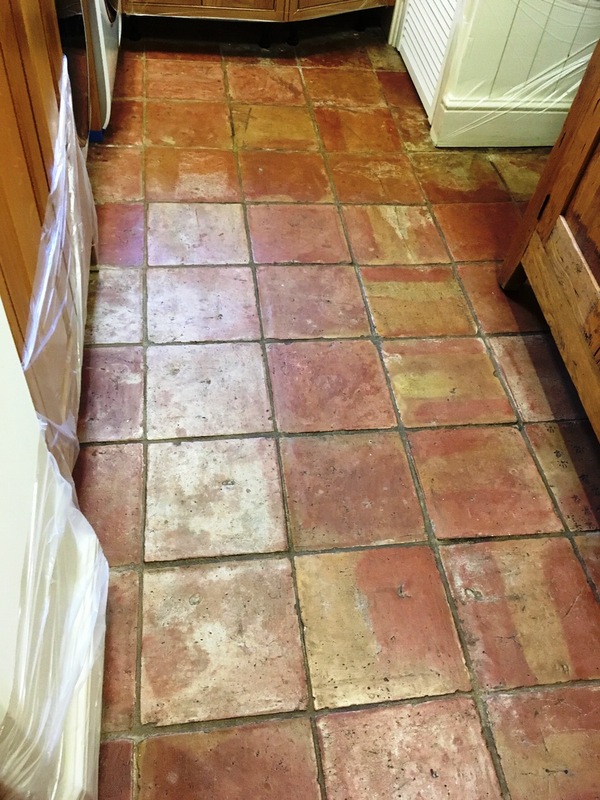 The tiles were in all the functional areas of including the Large kitchen/diner, pantry, utility room and downstairs WC and so had seen a fair share of wear which had worn off any protective sealers that may have been present. 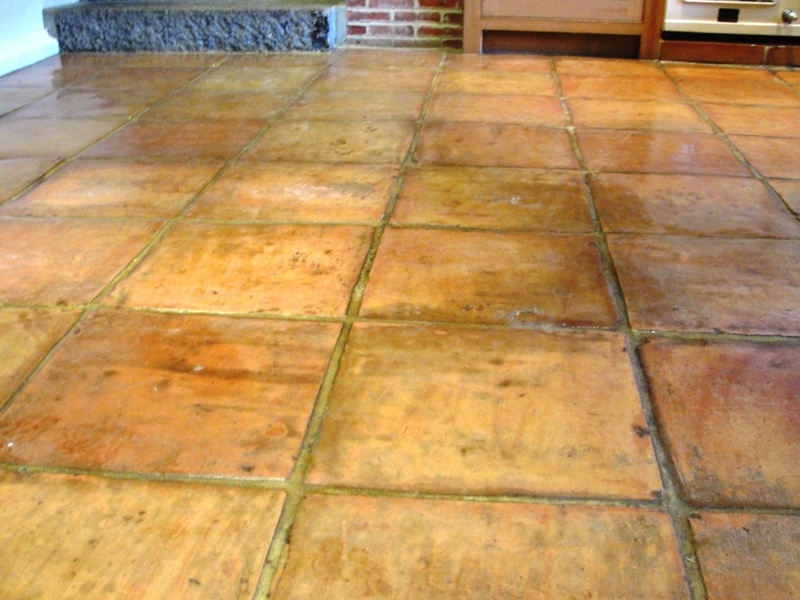 The floor had not received any maintenance for some time so it was now in dire need of a deep clean and re-seal. 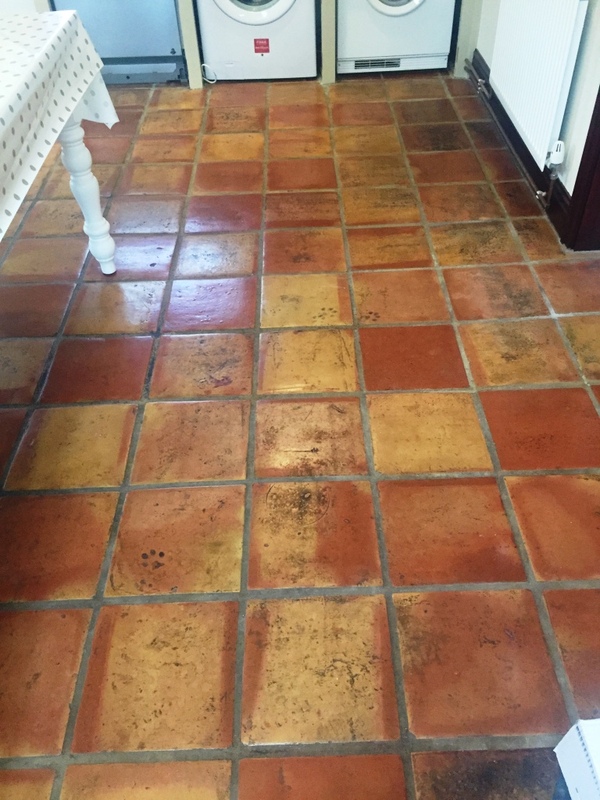 At a loss for how to improve the condition of the floor, the property owner contacted me to restore the Mexican Terracotta tiles back to their original condition. I visited the property to conduct a test clean and, impressed with the result I achieved, the client booked me in to complete the job. Before beginning the work, I made sure to cover the bottom of the kitchen units with plastic wrap to protect them from splashes during the cleaning process. 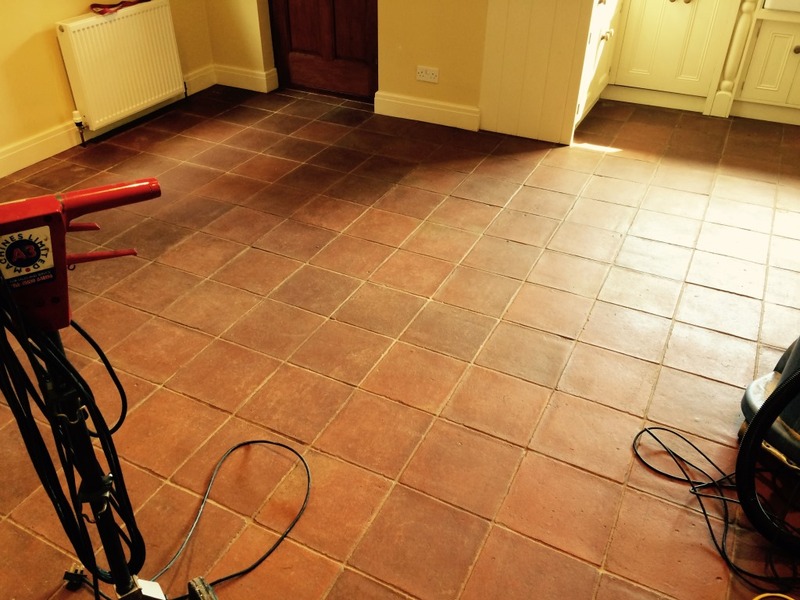 I then started to clean the floor using a strong dilution of Tile Doctor Pro-Clean in combination with a scrubbing brush fitted to a rotary machine. 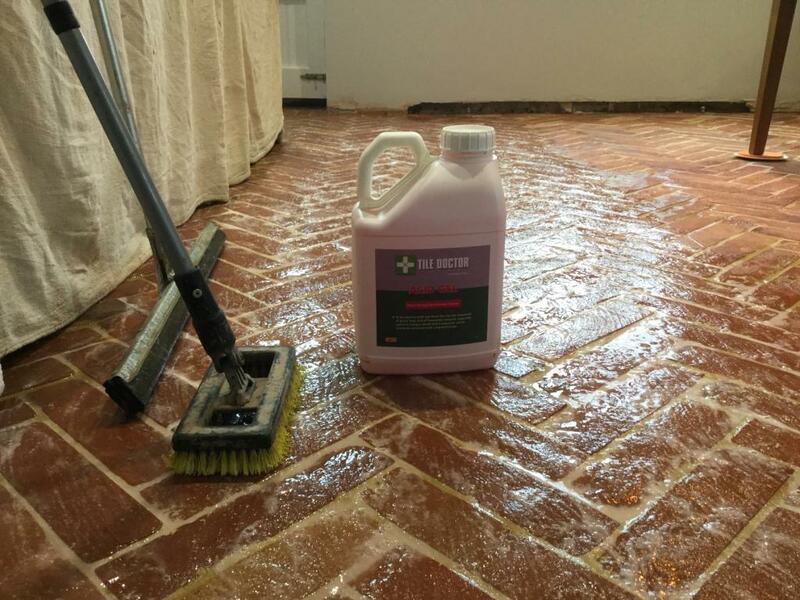 Pro-Clean is a versatile and powerful high alkaline that can be used with reliable results on all tile, stone and grout. 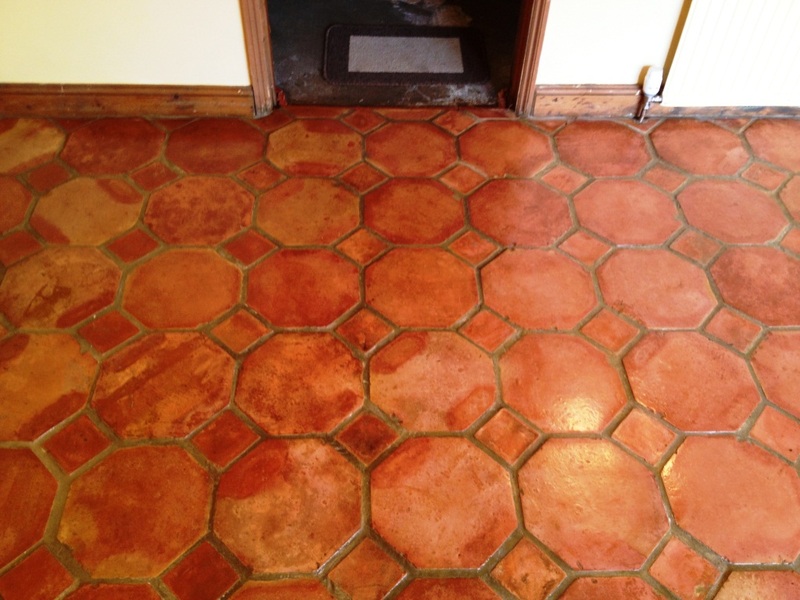 Once I applied it liberally across the floor I left it to dwell and seep into the pores of the tile. After scrubbing it was rinsed off using water and the soiled solution was extracted using a wet vacuum. 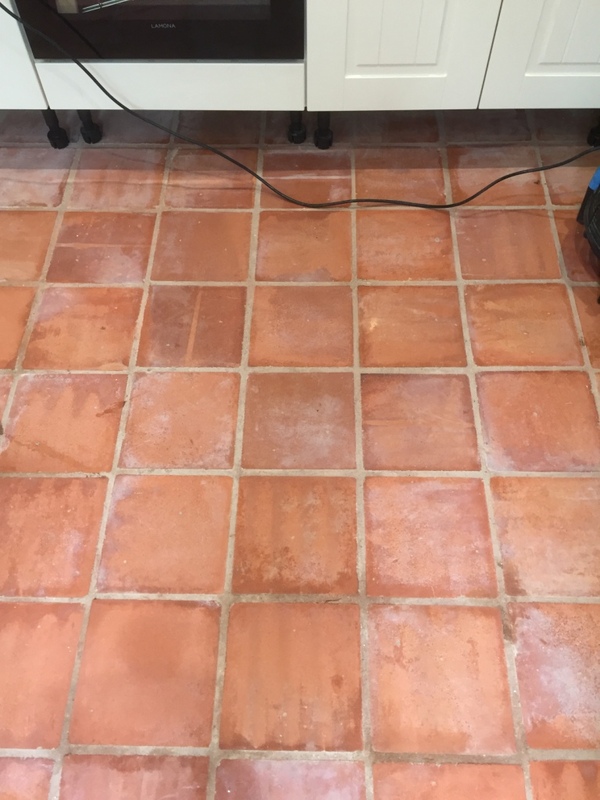 Stubborn stains were re-treated and then I focused my attention on to cleaning the dirty grout lines using more Pro-Clean scrubbed in with a special grout brush. 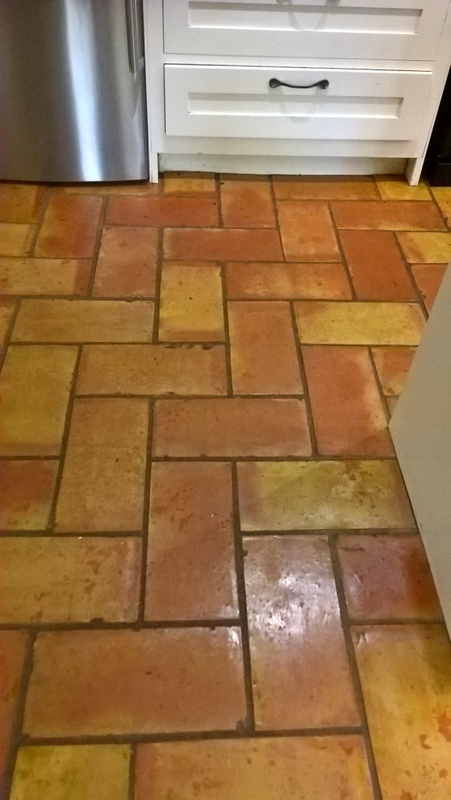 Once I was happy with the condition of the tile and grout I gave the floor a good rinse with water and used the wet vacuum machine again to remove as much moisture from the floor as possible and then left the floor to dry off fully overnight. Upon my return to the property I immediately checked the floor to see if it was dry enough to be sealed (thankfully, it was). Testing for damp issues is incredibly important before sealing because any excess moisture can affect the sealer and negatively affect its performance. 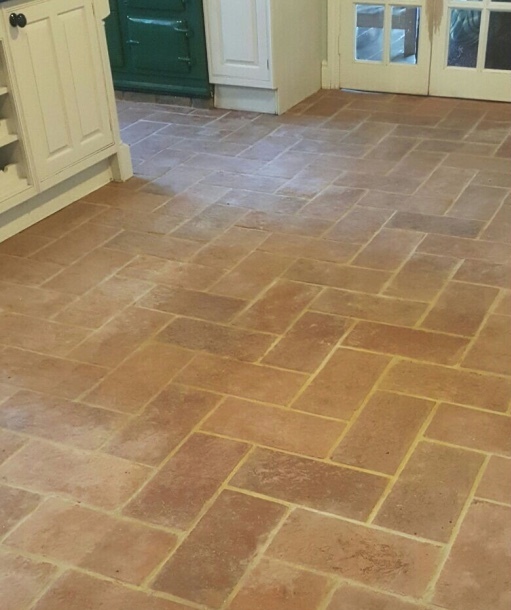 I sealed the floor using two coats of Tile Doctor Colour Grow, an impregnating, colour enhancing sealer which offers the natural looking, matte finish the customer requested to match the rustic feel of the tiles. This post comes from a job I did for a customer in who lives in the town of Runcorn on the south bank of the River Mersey. 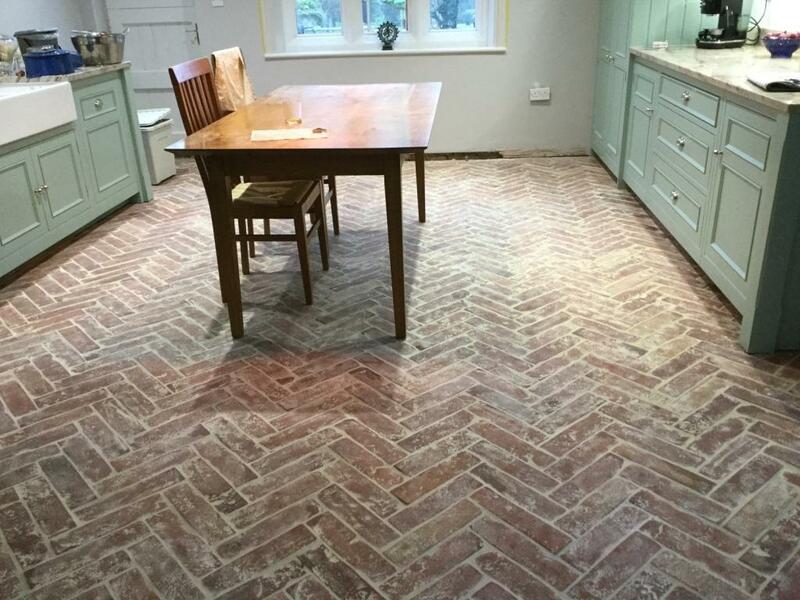 The request was to restore the Terracotta floor tiles in the kitchen of a property which dated back to 1773 and still had all its original features inside and out. 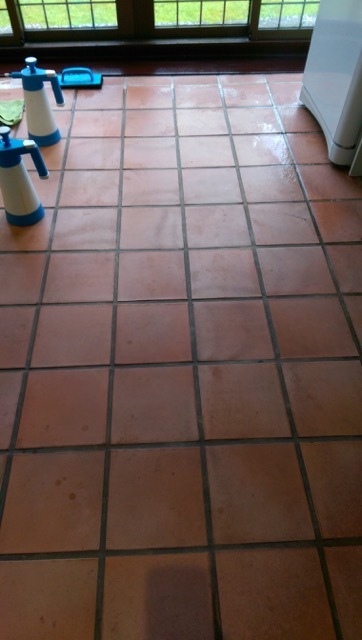 You can see from the photograph below that the tile and grout were looking very dull and well overdue a deep clean and seal. 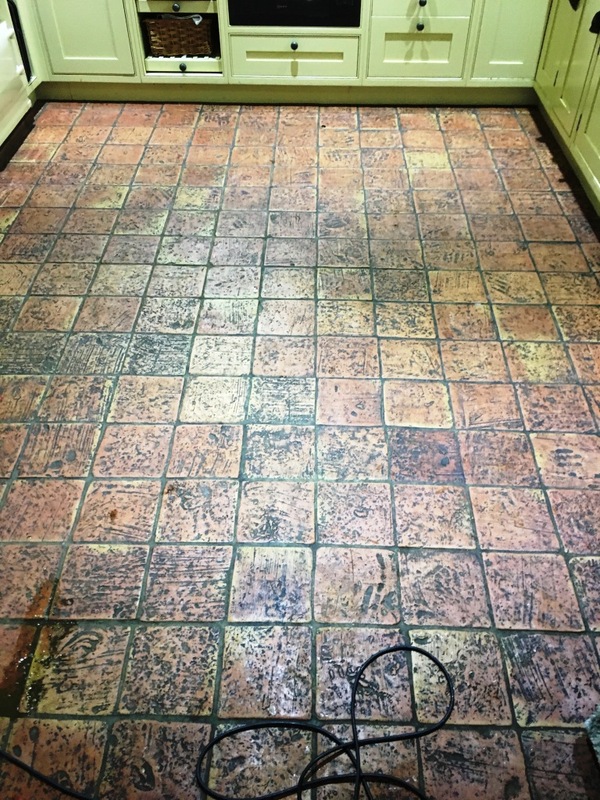 To clean the floor, I soaked the floor in a strong dilution of Tile Doctor Remove and Go which is a strong stripping and cleaning solution which removes sealers and also draws out ingrained stains and also the heavy grease build up that was present around the cooker. After twenty to thirty minutes the solution was worked into the tiles using a black scrubbing pad fitted to a rotary machine. 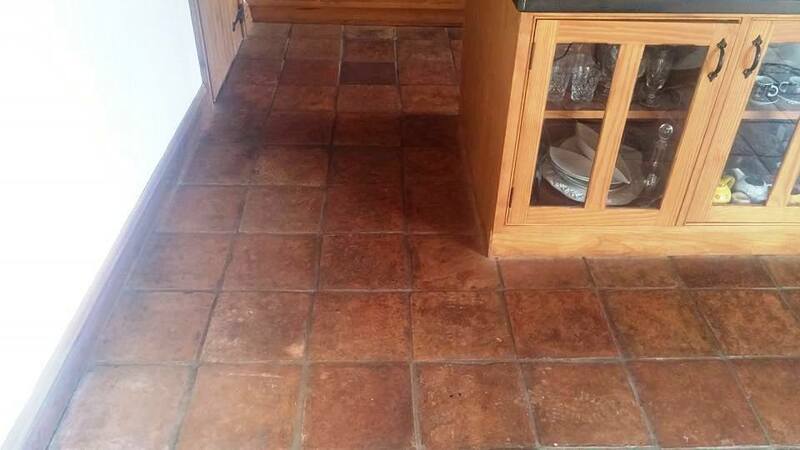 The soiled solution was then removed with a wet vacuum and this was followed by scrubbing the grout lines with more Remove and Go and a grout brush until they were clean. 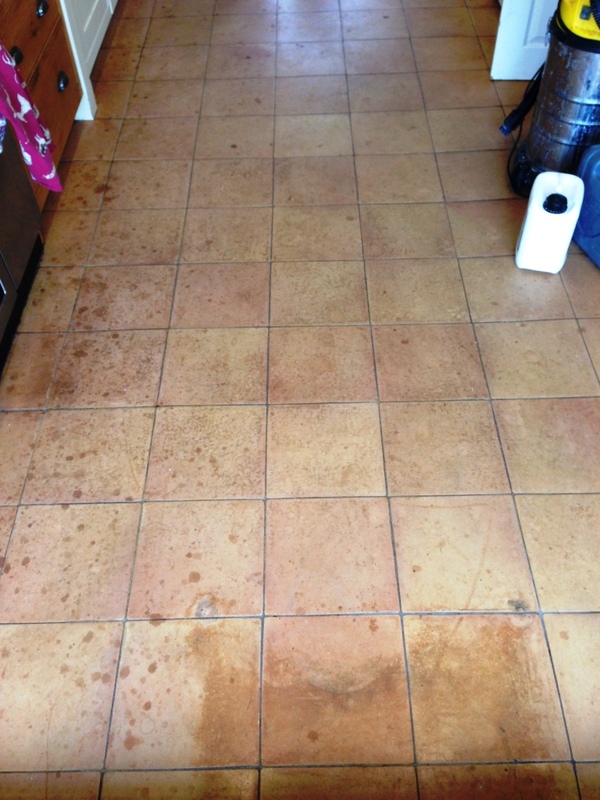 The whole floor was then rinsed with water to remove any soil and trace of cleaning product. The water was then extracted using the wet vacuum. 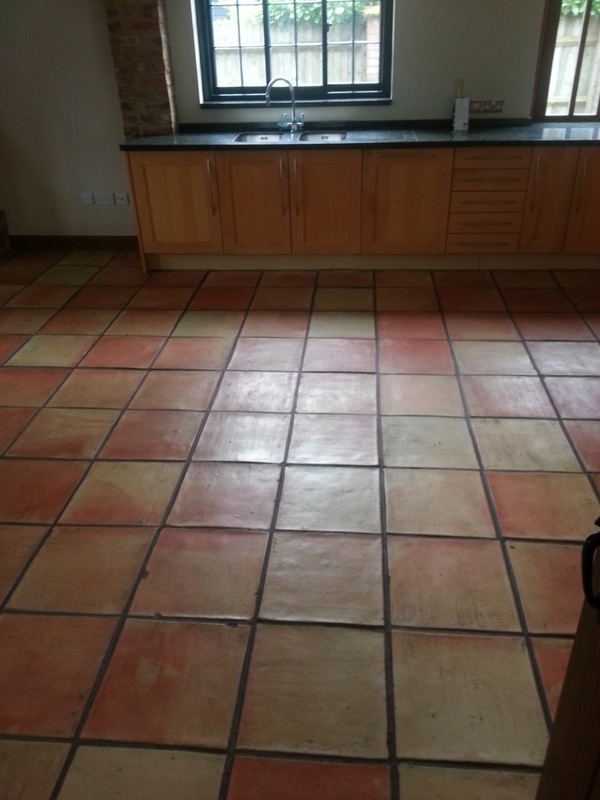 The floor was then checked to make sure it was as clean as it could be and stubborn areas spot treated. 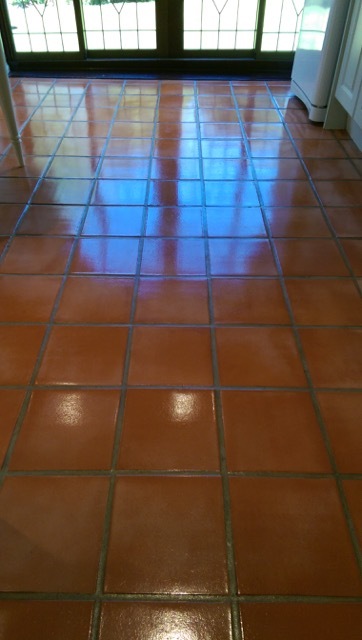 Once I was happy the floor was clean it became apparent that some of the grout was loose and would need replacing so I took care of that using a matching grout before calling it a day and leaving the floor to dry out overnight. 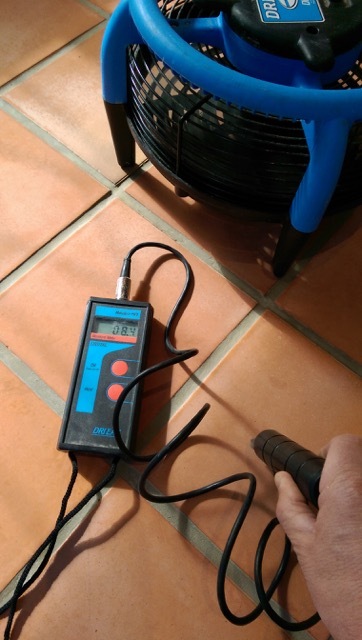 We returned next morning and tested the tiles with a damp meter making sure it was dry before we could seal it. 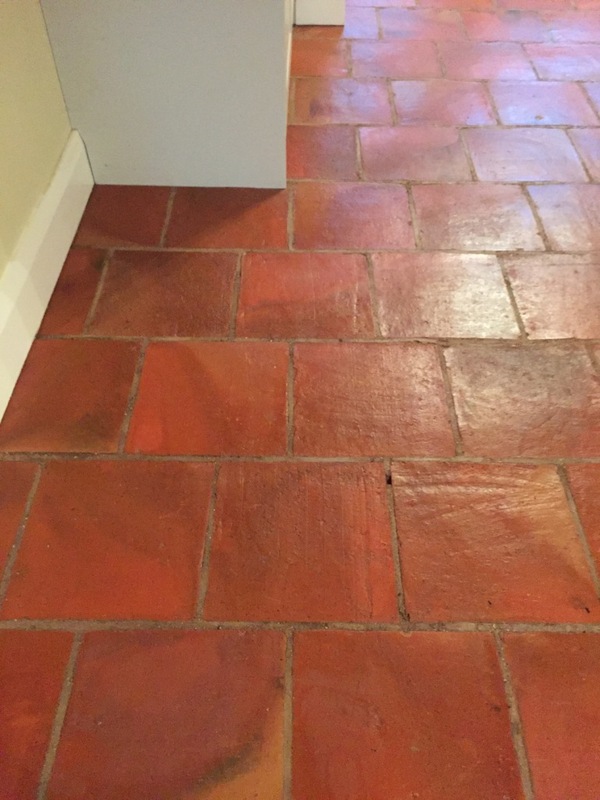 To seal the floor, I used Tile Doctor Seal and Go which adds a nice sheen to the tiles and works really well on Terracotta. 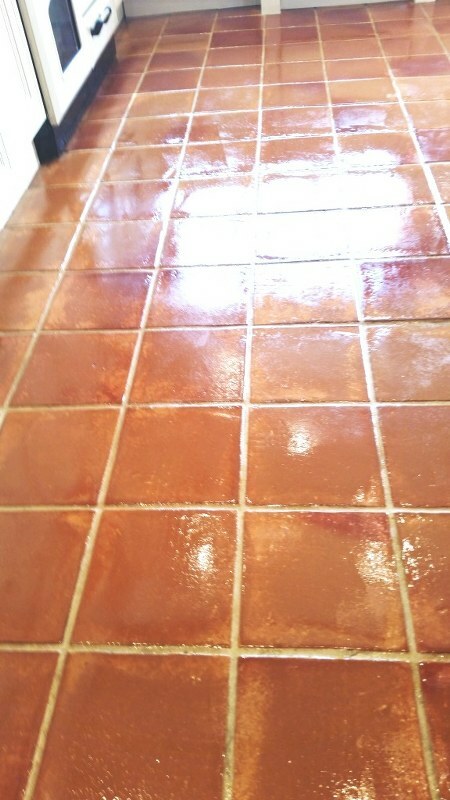 I took some time to complete though as due to the porosity of the clay it required eight coats to fully seal the tiles. You have to wait between coats to allow them to dry however I was able to speed up the drying process though using an air blower. 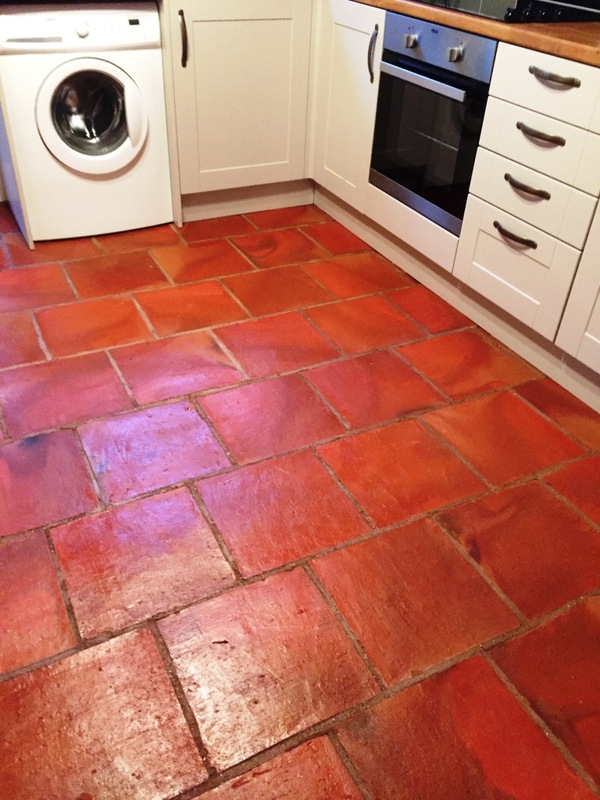 Terracotta may be one of the most aesthetically pleasing types of tiled floor, but as many of our customers will tell you can be particularly difficult to keep clean. This is due to the naturally high porosity of clay, which allows dirt to become very easily trapped. 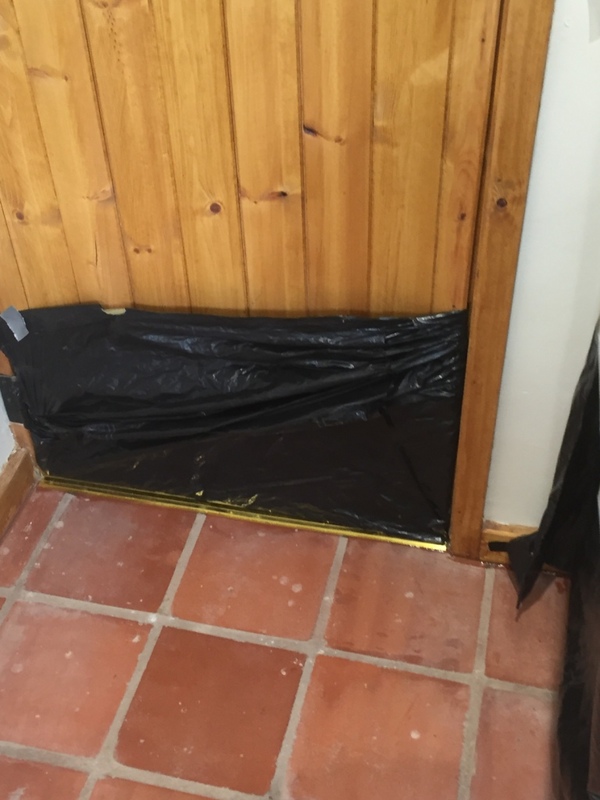 Quite commonly this situation is made worse by a lack of an adequate sealer to block the intrusion of muck. 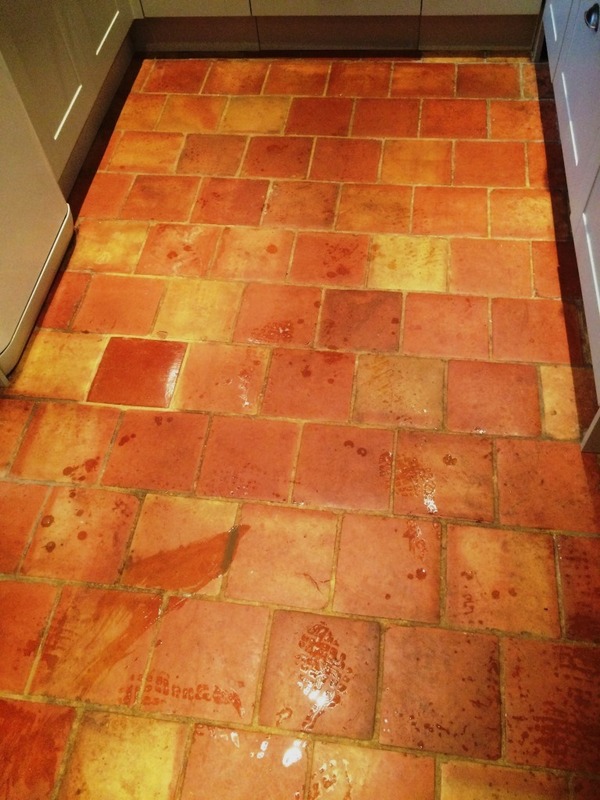 Of course, poor quality cleaning products also make it difficult for property owners to keep their Terracotta tiles clean, and a combination of the two problems can leave these floors looking a lot like this one, located in the kitchen of a house in the beautiful Forest of Dean. 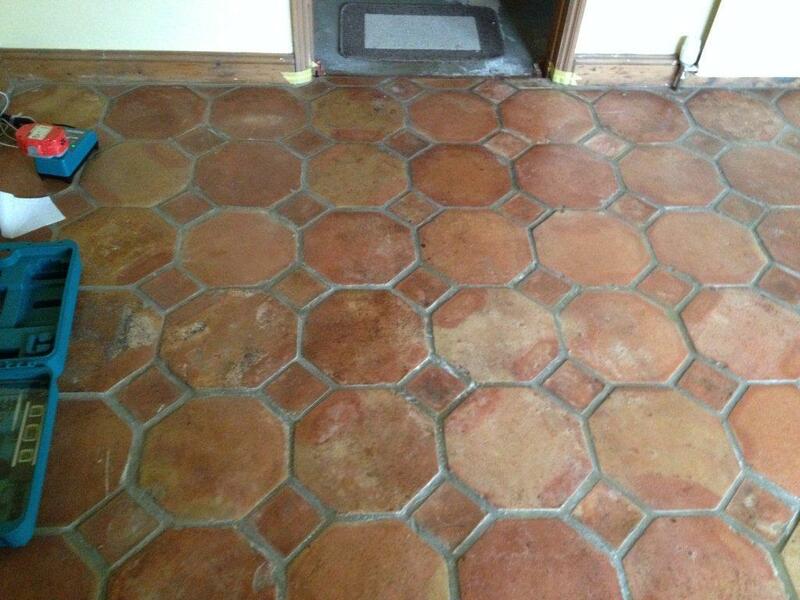 The property owner was keen to have me restore some character to her dull Terracotta tiles. 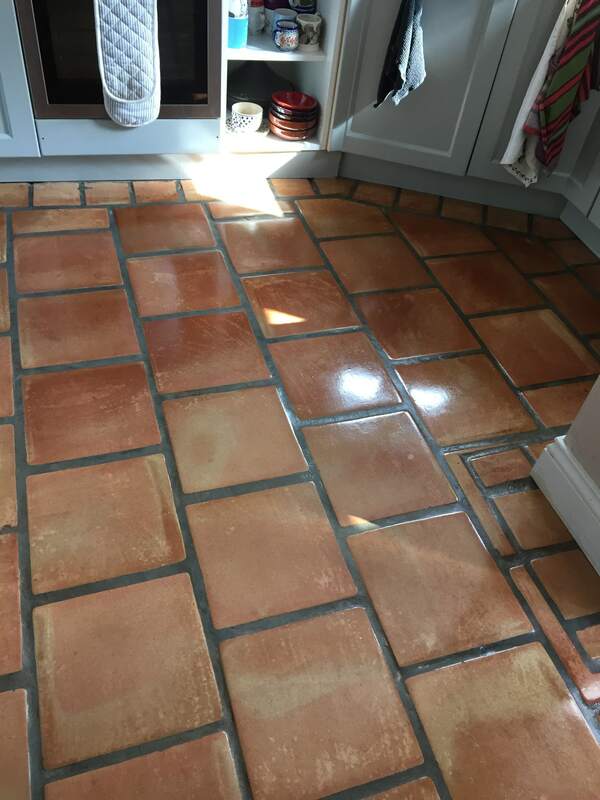 It was proving increasingly difficult for her to keep them clean due to the reasons described before, and the grout had also become very dirty. So, the customer turned to me for some professional assistance. 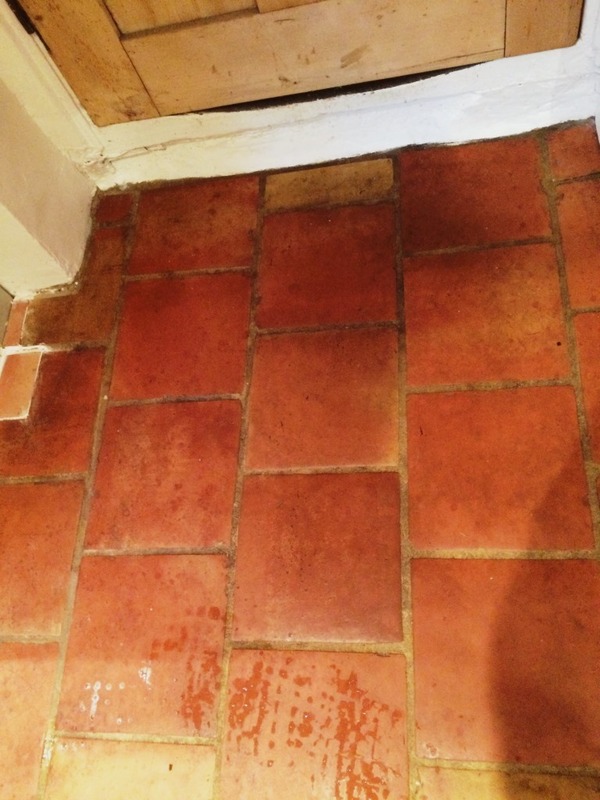 While these Terracotta tiles had been sealed previously it had, over time, lost its ability to protect the stone against ingrained dirt. 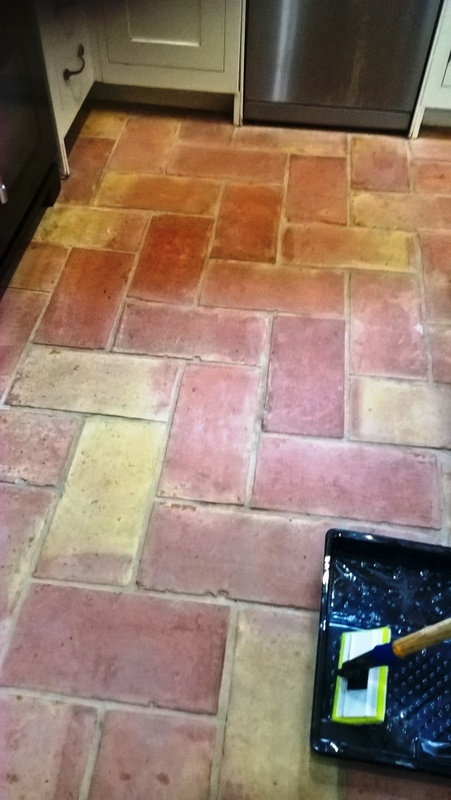 To remove the old excess sealer my product of choice was the heavy duty soil remover and stripper, Tile Doctor Remove & Go, which I applied liberally across the surface and scrubbed in to the tile used a rotary machine fitted with a scrubbing pad. This also helped to remove the trapped dirt and left the stone looking fresher. 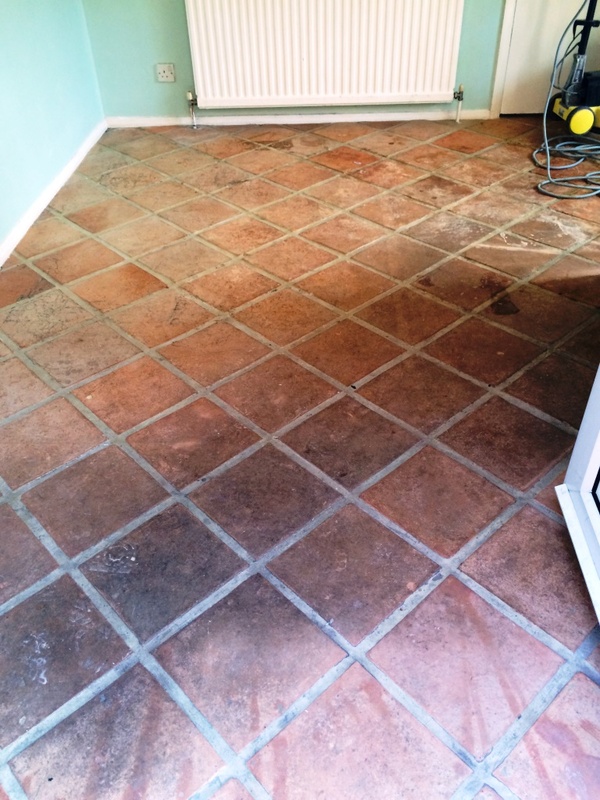 Once the old sealer was removed – to be replaced with a fresh sealer once cleaning was complete – I was free to focus on the troublesome grout lines with Tile Doctor Pro Clean, an alkaline cleaner that reliably breaks down dirt. When cleaning the grout, I opted to use a handheld grout brush that allowed for more precise, careful application of the product. As per usual, the floor was given a good rinse and left to dry for 24 hours. Upon returning to the property I checked the floor was completely dry, ready for sealing. 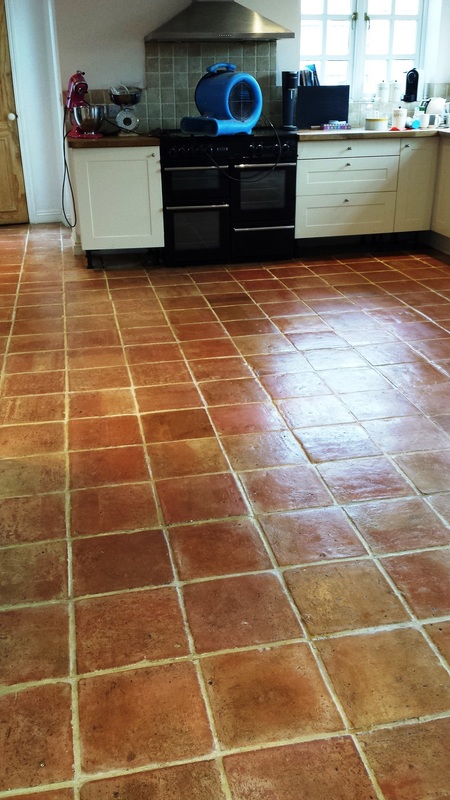 My process for sealing actually involved the application of two different kinds of sealer; initially I applied a single coat of Tile Doctor Colour Grow which has soaks into the pores of the tile and has the added bonus of enhancing its natural colours. 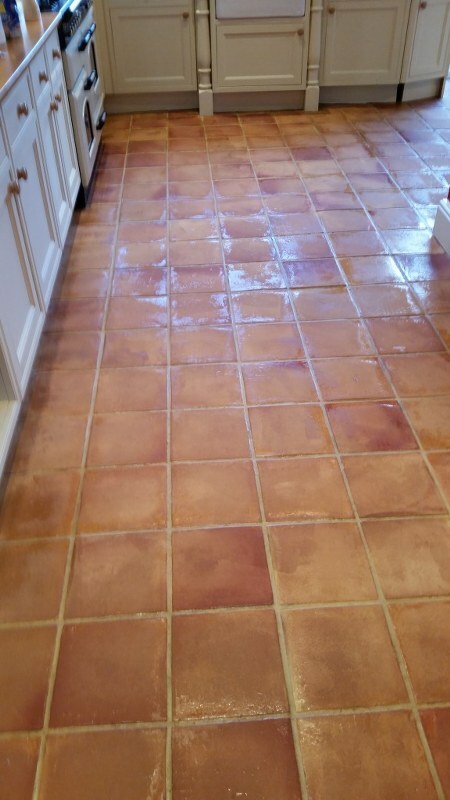 Once this had dried I then applied ix coats of Tile Doctor Seal and Go, a product which forms a durable layer of protection of the surface of the tiles and at the same time provides a lovely sheen finish. 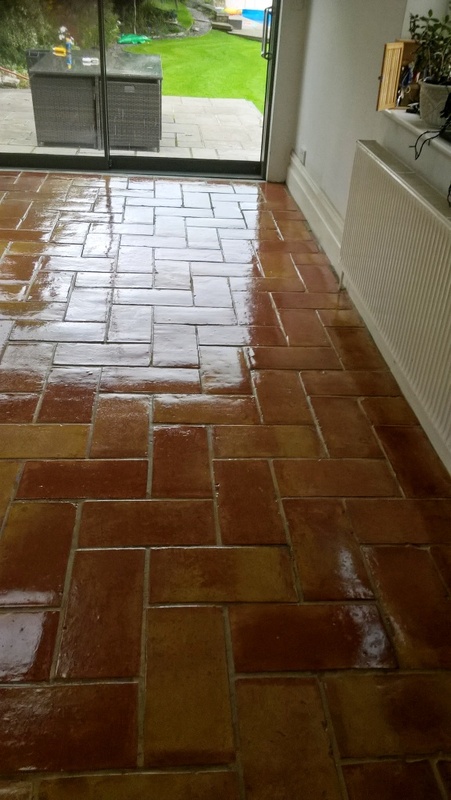 The combination of the two sealers will certainly offer a long-term solution to the ingrained dirt problem, and the appearance-enhancing properties in the products really helped to transform the tiles from dull and dirty to lively and eye-catching. Nonetheless, before departing the property, I also left my very pleased customer with some cleaning advice for the future. 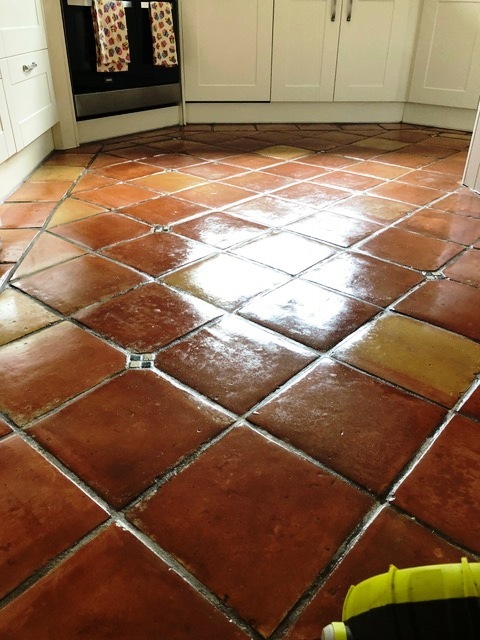 Having an effective sealer in place is essential for ensuring the long term condition of tiled floors in fact a lack of sealer can make cleaning the tiles exceptionally difficult as the sealer prevents dirt becoming ingrained in the tile. 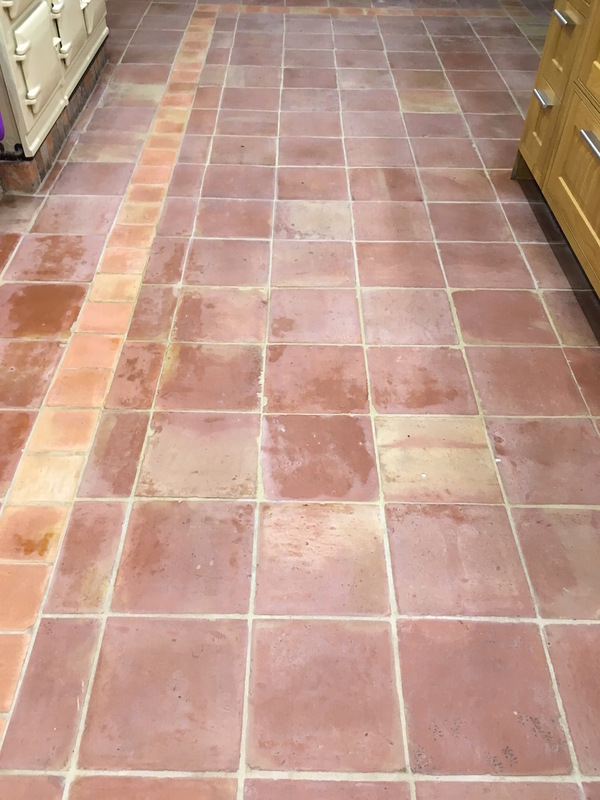 This property owner, living in the former spa town of Matlock in Derbyshire, was experiencing problems with their Terracotta tiled kitchen floor since they had applied some kind of wax to act as a sealer, and this had worn off within a few weeks. 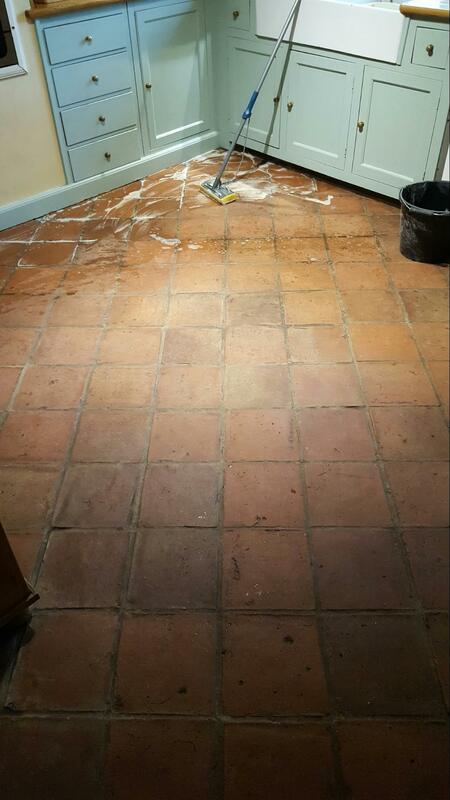 After this happened the tiles were not sealed again, making cleaning a big problem. 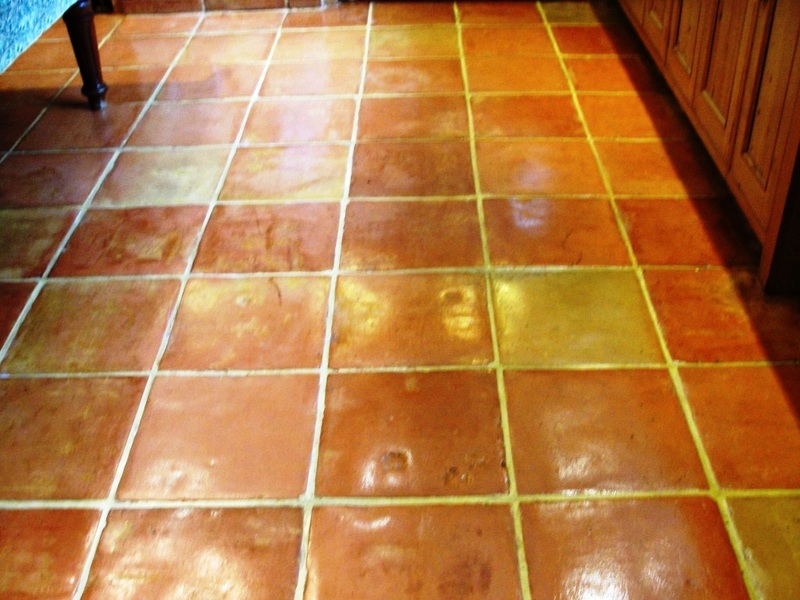 Terracotta is a highly porous stone and thus easily soaks in spillages and stains, and allows dirt to become very easily trapped. In this situation, the property owner resolved to contact me about some professional maintenance. 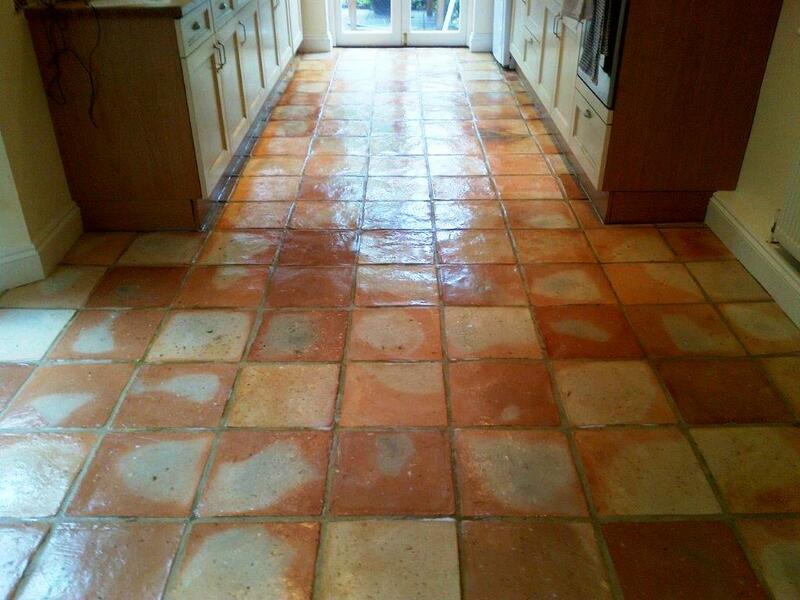 I suggested that the tiles would need a deep clean followed by the application of a fresh, high quality sealer. The work was agreed on and I made my way down to the property the following week. 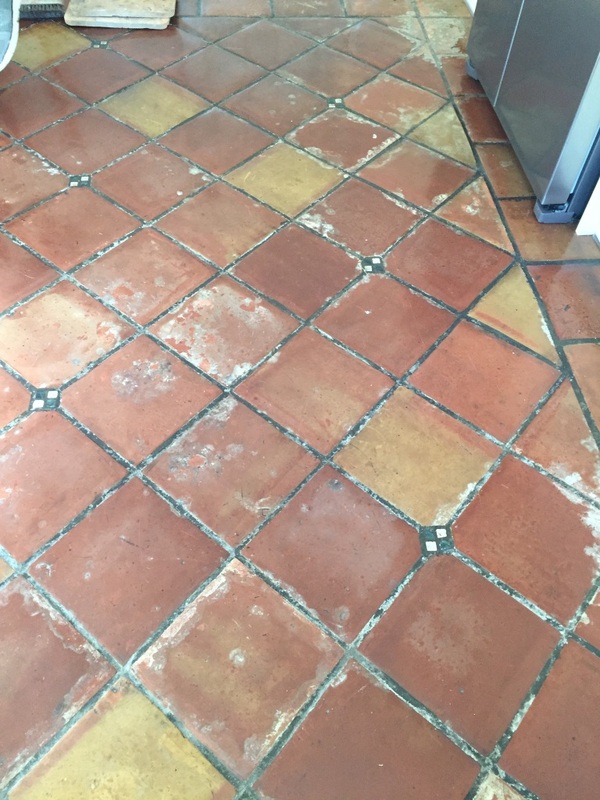 When I arrived at the property and saw the tiles first hand it became clear that a professional clean had been in need for a long time: greasy looking stains were particularly prevalent and covered large areas of the kitchen floor. 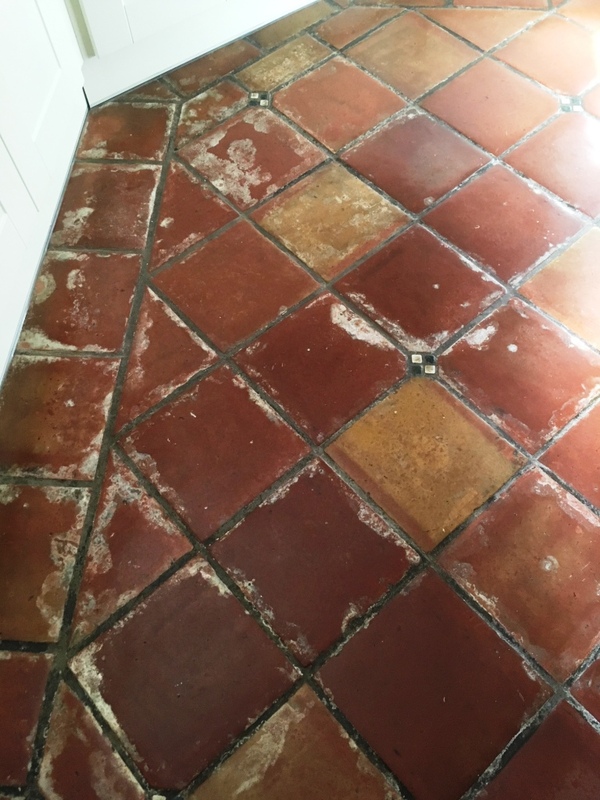 To remove I mixed a strong solution of Tile Doctor Pro Clean, which is a multi-purpose, high-alkaline cleaner, stripper and degreaser, and, working in small areas, applied it to the floor. Working in small sections was important because the stone is very porous and quickly soaked in any product laid down. I scrubbed the cleaner into the stone using a rotary machine fitted with a black scrubbing pad, with the dirt and stains coming away nicely. 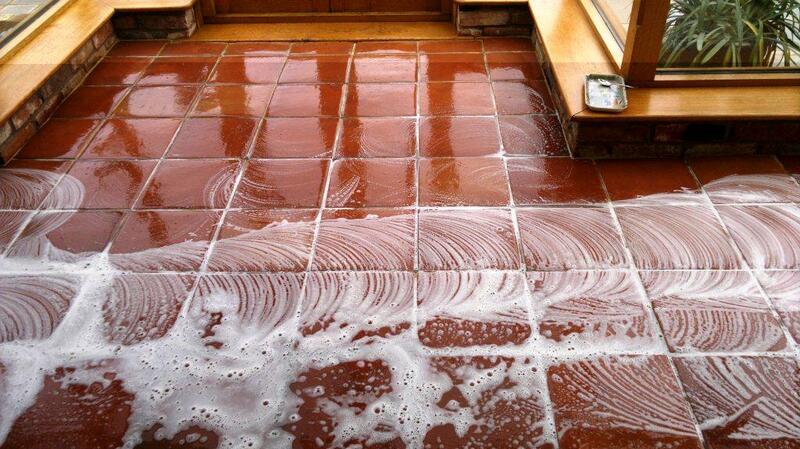 Pro Clean is highly versatile and can be used for similar cleaning purposes on most types of natural stone floor. After cleaning each section, I quickly removed the excess dirty water and chemicals with my wet vax machine. Once the whole floor had been cleaned I rinsed it several times with fresh water just to make sure all cleaning chemicals were gone. I then left the floor to dry completely for 36 hours. 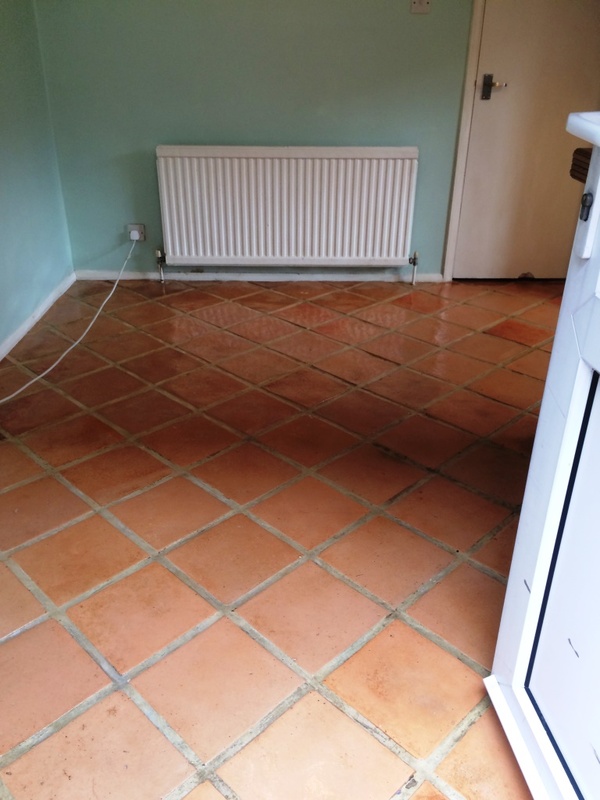 When I returned to the property, I conducted several damp tests to check for any areas of the floor that needed further drying. As is almost always the case, there were a few areas that remained slightly damp, and I set about speeding the drying process along using my heat gun. In fact, it actually took me more than three hours to get the floor completely dry, but this was worth the effort as even the slightest excess moisture can damage the performance of the sealer. 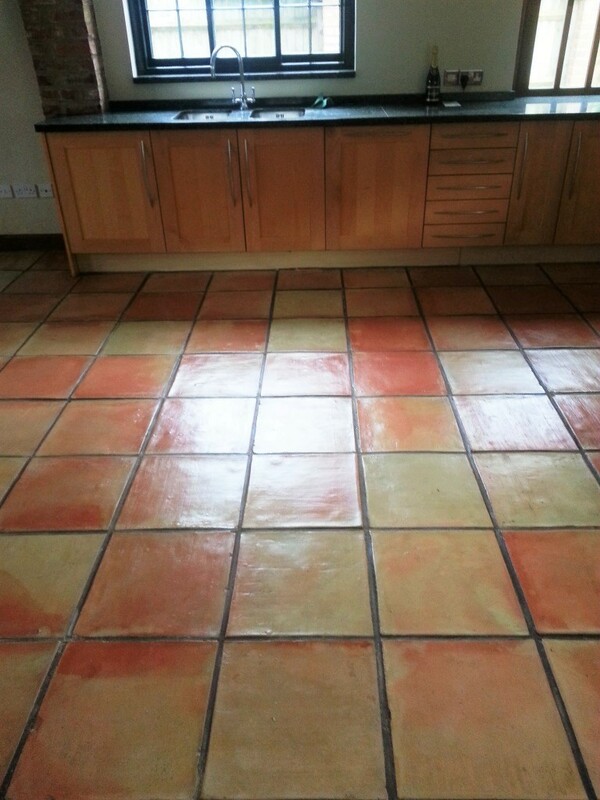 Once the floor was finally dried I began sealing the floor with one coat of Tile a Doctor Colour Grow sealer. 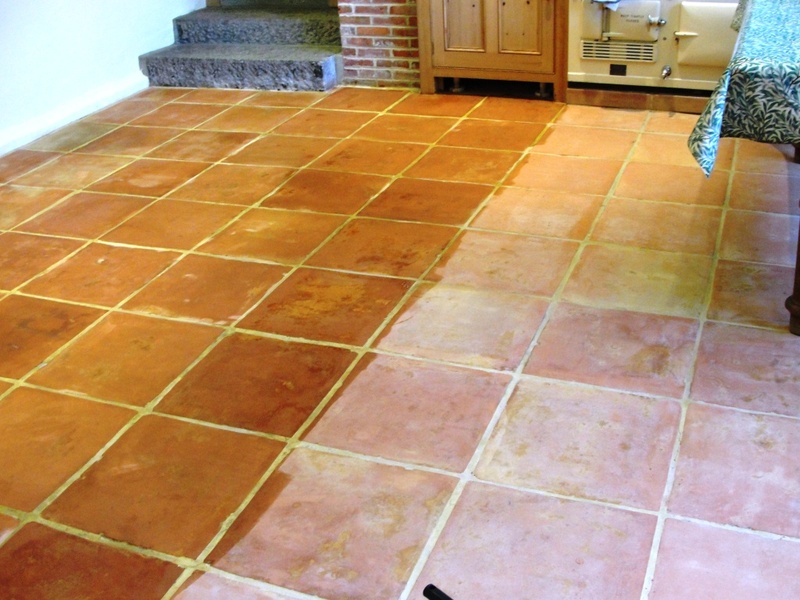 Colour Grow is an impregnating sealer that penetrates deep into the pores of the stone, thus acting as a shield against ingrained dirt, and also raises the colour of the tiles to provide an aesthetically appealing appearance. sealer. 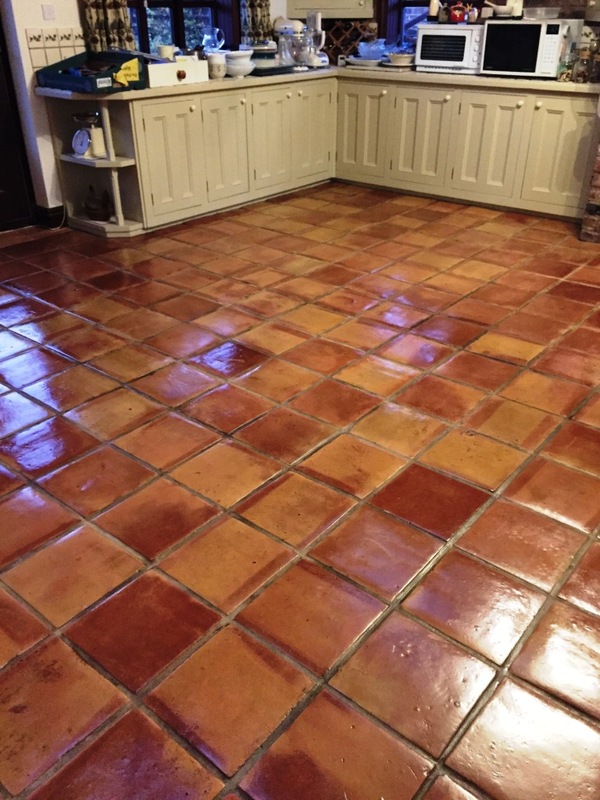 After sealing with Colour Grow, I left the floor to dry for couple of hours and then applied six coats of Tile Doctor Seal & Go, which is a topical sealer that builds up durable protection on the surface of the tiles. 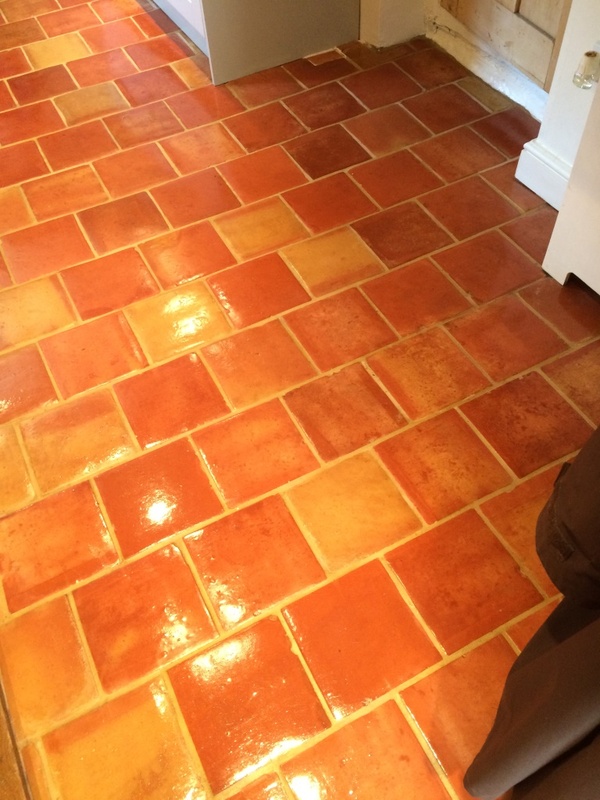 The combination of through cleaning and the application of not one, but two high quality sealers really did wonders for the appearance of these Terracotta tiles. Looking at the final results you wouldn’t have believed they had been without a proper clean and seal for so long! Needless to say the customer was exceptionally pleased and will surely be able to keep her floor looking great for a long time to come. 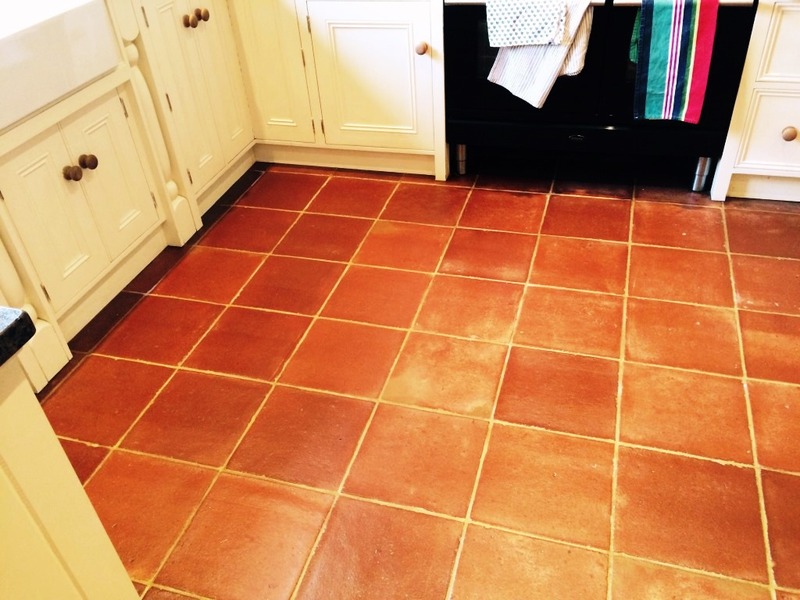 This Terracotta tiled kitchen in the village of Willingale near Maldon, in the Epping Forest District of Essex had lost its finish and looked slightly dull. 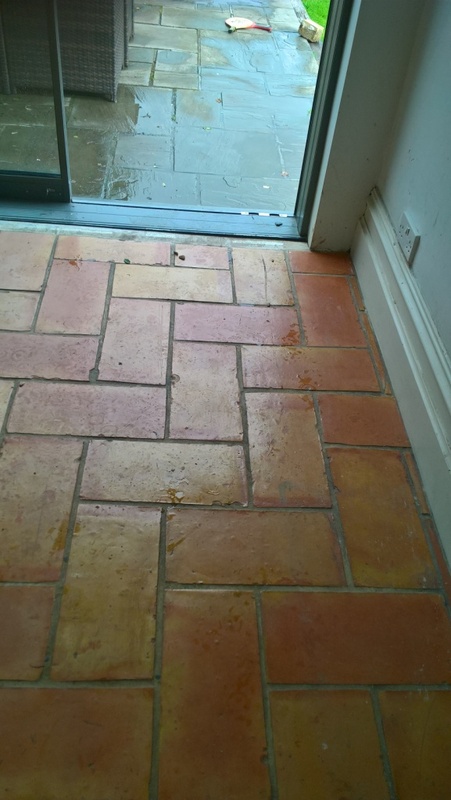 The client wanted the tiles restored to a shiny finish and additionally wanted the two cracked tiles replaced in the kitchen doorway. 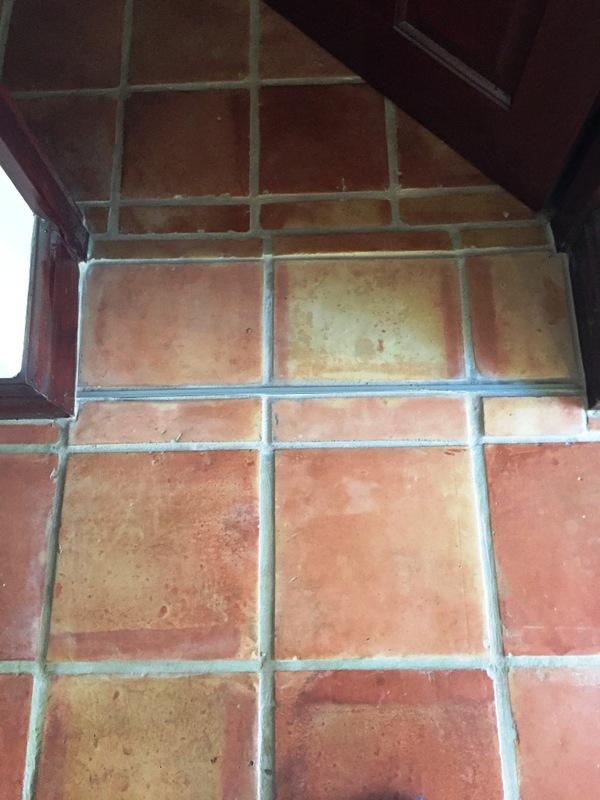 I started by removing the two cracked tiles using an angle grinder and cleared away the grout to leave the edges of the remaining tiles as smooth as possible. The next stage was to strip and clean the tiles and grout lines. 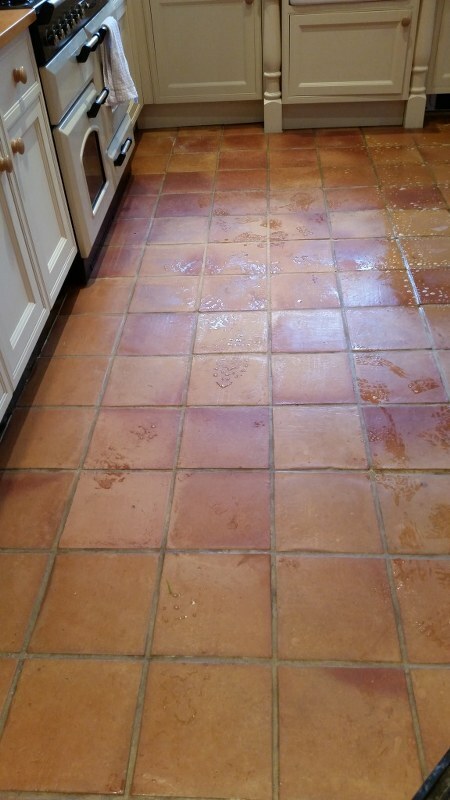 I dampened the tiles with water before applying Tile Doctor Remove and Go, a product which breaks down existing sealers so they can be scrubbed off the tiles and rinsed away. To make the work easier I used a rotary machine fitted with a black scrubbing pad to work the solution in and then pressure washed them using a spinner tool attached to a wet extraction machine mounted in my van. This process blasts any remaining dirt and sealer from the stone and grout lines and vacuums the waste into a holding tank in the van. This process took most of the day, but just before I left I replaced the broken tiles with two new ones and re grouted them in place, fortunately these tiles were still available and so it wasn’t difficult finding replacements. The tiles and grout were left to dry over night. 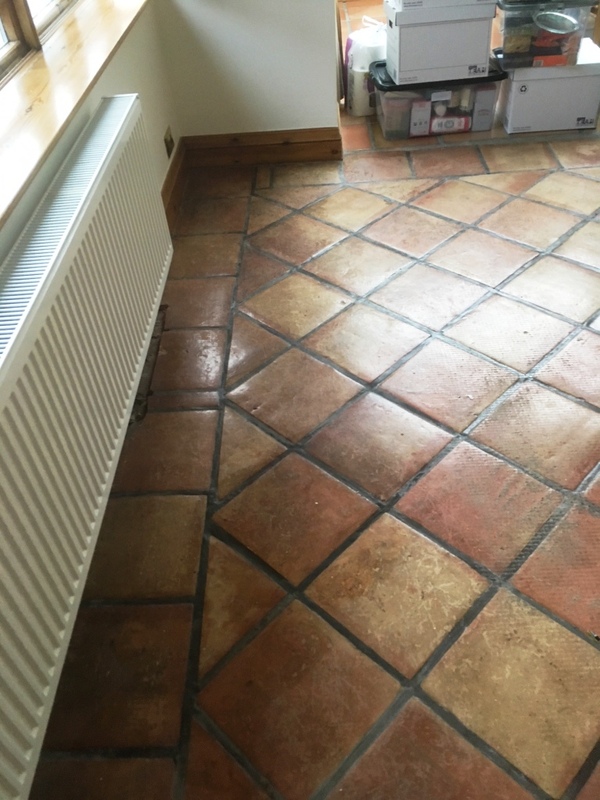 The following morning I damp tested the floor before beginning to seal the floor, this is an important check as damp can upset the sealer and lead to unexpected results. 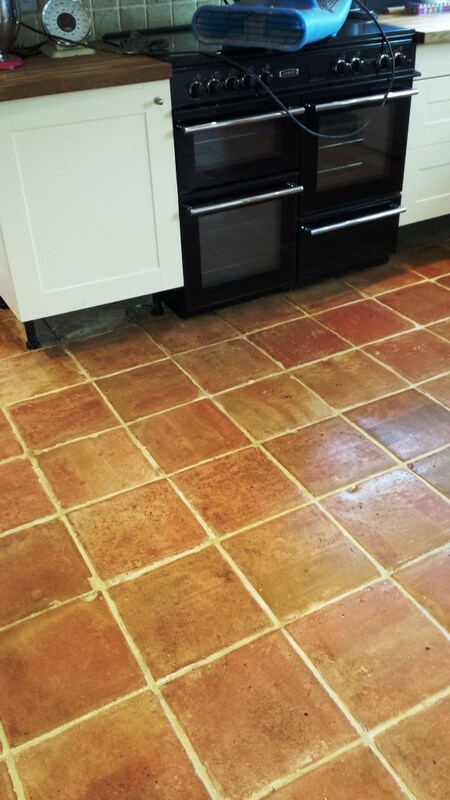 Once I was satisfied the tiles were dry I applied five coats of Tile Doctor Seal and Go, leaving the stone with a healthy lustre. 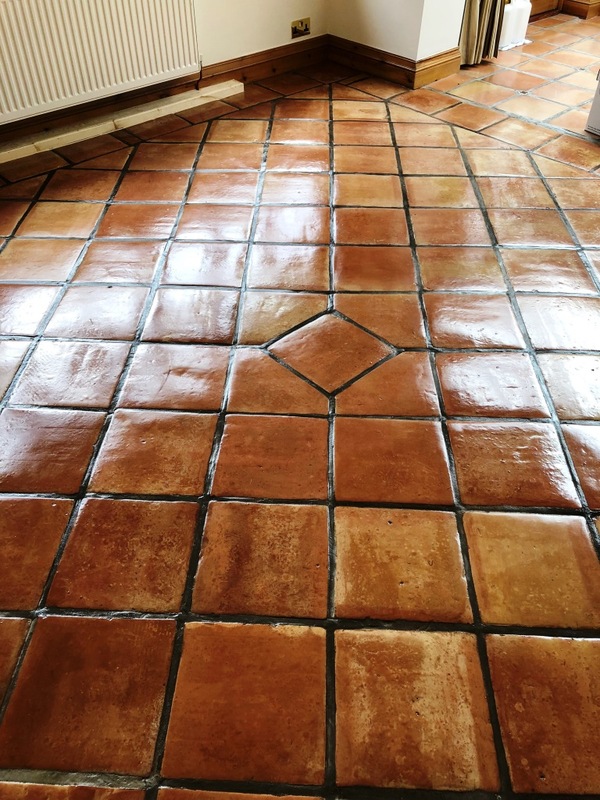 Seal and Go is a topical sealer that is highly recommended for Victorian, Terracotta and Quarry tiles and being water based it doesn’t leave a smell as it dries. 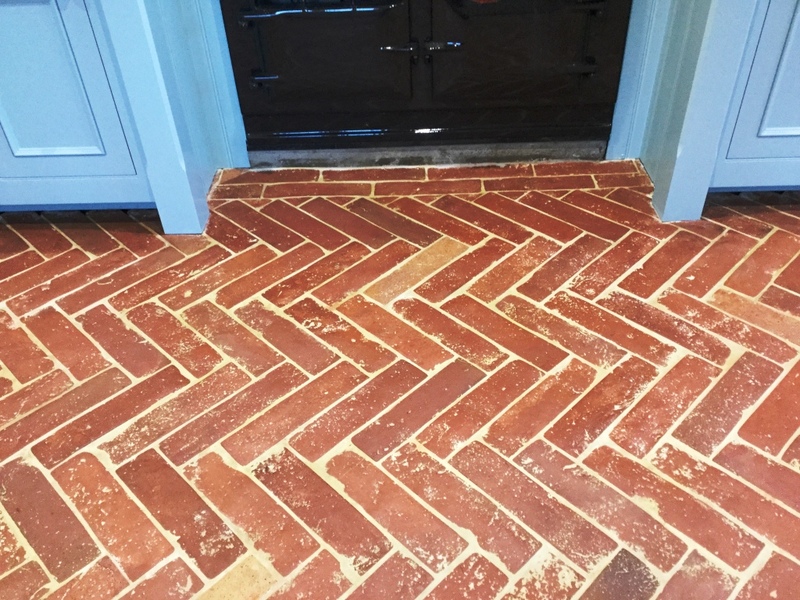 The new owner of this house in the very old and quaint English village of Penn, Buckinghamshire wanted to refresh the look of the Terracotta tiled kitchen floor before they moved in. 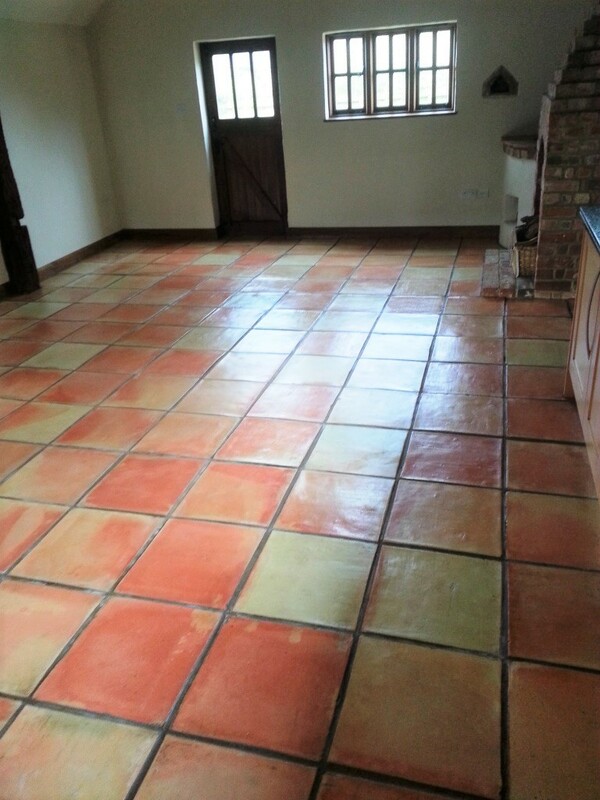 It had suffered from a heavy soil build-up of dirt over time due to inadequate maintenance and ineffectual sealer. 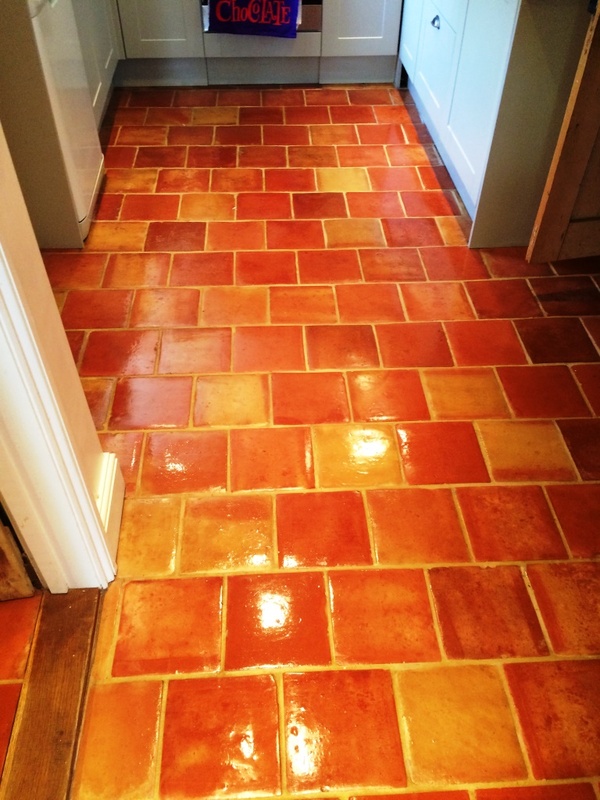 Since Terracotta (which came into popular use in the West in the 19th century) is highly porous, large amounts of dirt can become ingrained very quickly if not taken care of. 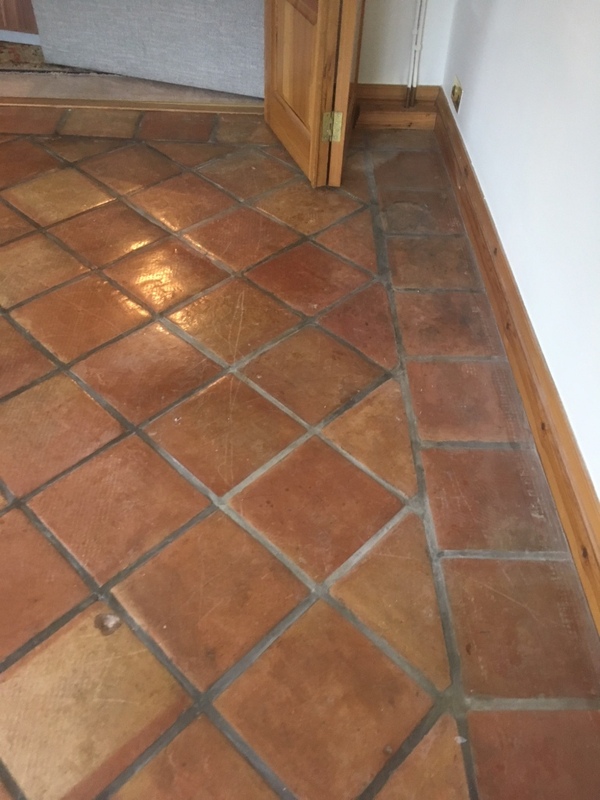 Restoring this floor would be a two-day job, including thorough cleaning and stripping, as well as the application of a fresh sealer to provide long-term protection. 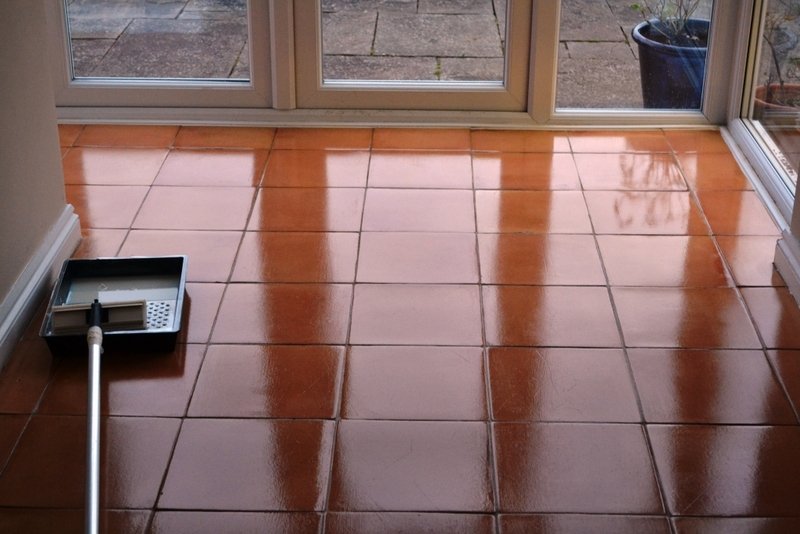 The first day was spent giving the tiles a deep clean. 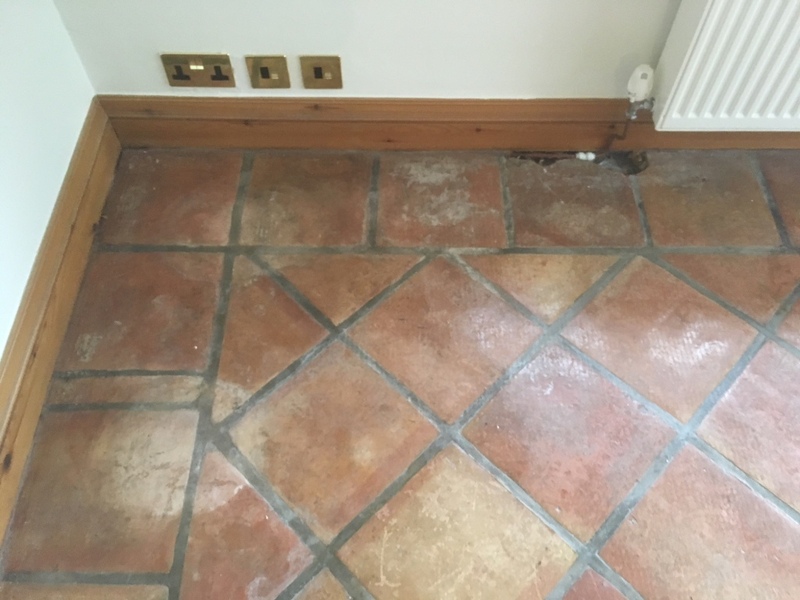 To begin, I mixed a strong solution of the heavy duty alkaline cleaner, Tile Doctor Pro Clean, which a versatile product suitable for tackling heavy soil build up on a range of natural stone floors. The solution was spread evenly across the surface area of the floor, before being worked into the stone with a commercial rotary machine fitted with an abrasive scrubbing pad. This really helped to break down the layers of muck. 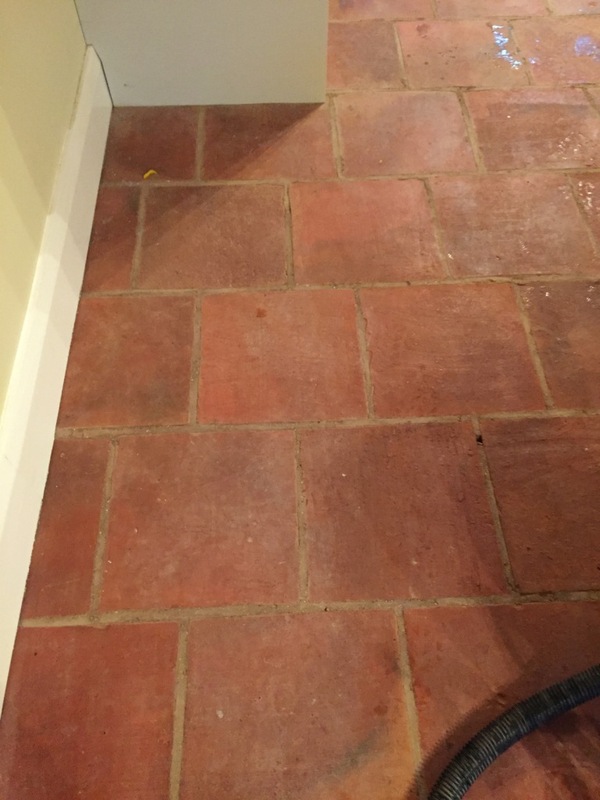 Next, I paid particular attention to the grout lines, scrubbing them with the acid-based Tile Doctor Grout Clean Up to remove dirt and neutralise any grout haze and mineral salts that had built up. 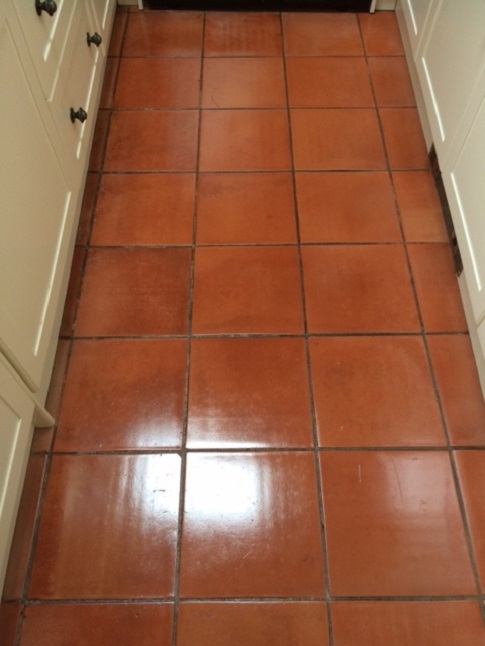 Thanks to this the stained grout lines were restored to their original colour. 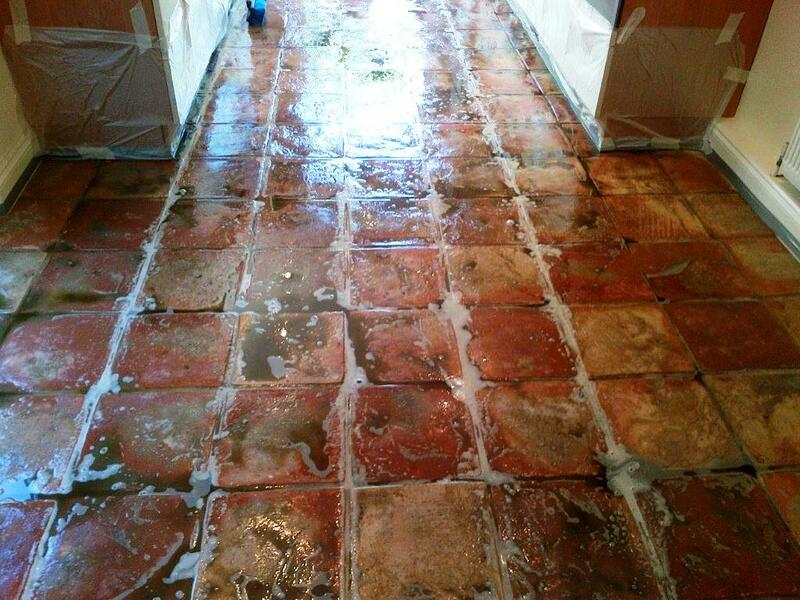 The final task on day one was to strip away the remaining failed sealer using Tile Doctor Remove & Go, which is specially designed for this purpose. Similar to earlier, the product was worked in using the rotary machine and abrasive pad. Once the cleaning process was complete, I washed the floor to remove all chemicals and slurry, before leaving the floor to dry naturally overnight. Returning to the house the next day, I firstly checked for any remaining moisture on the, which is important as it can negatively impact sealer performance. With everything in good condition I proceeded to seal the tiles using the solvent-based, topical sealer known as Tile Doctor Seal and Go. 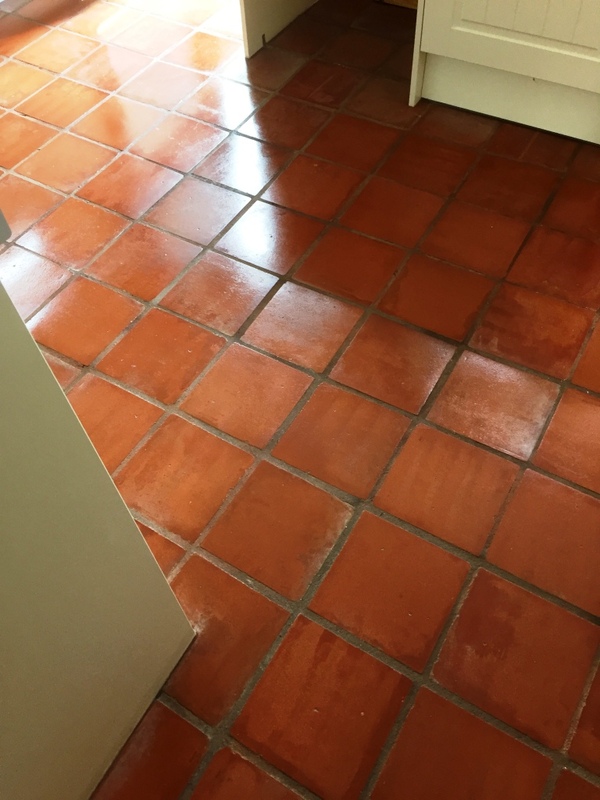 I applied multiple coats in order to build up sufficient protection on the surface of the tiles to reduce the damage of future spillages and staining. 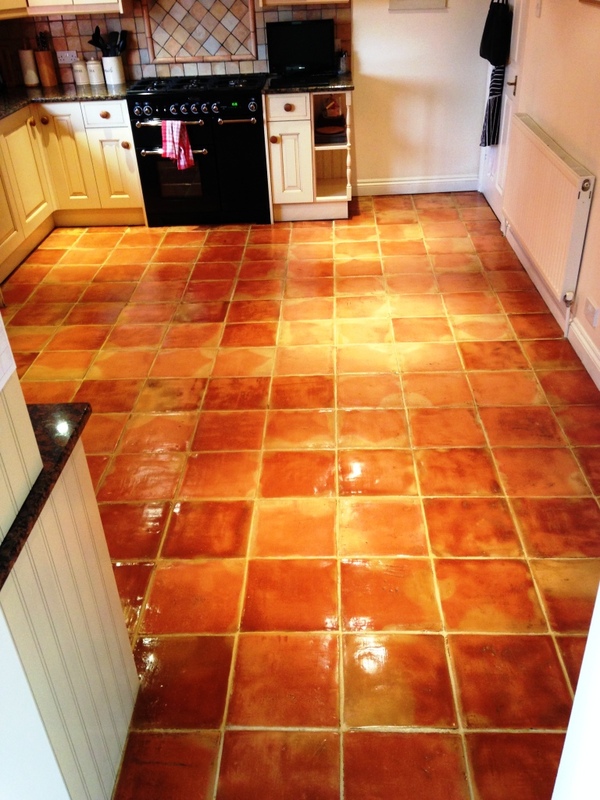 The sealer will also provide a durable and aesthetically pleasing low sheen finish. 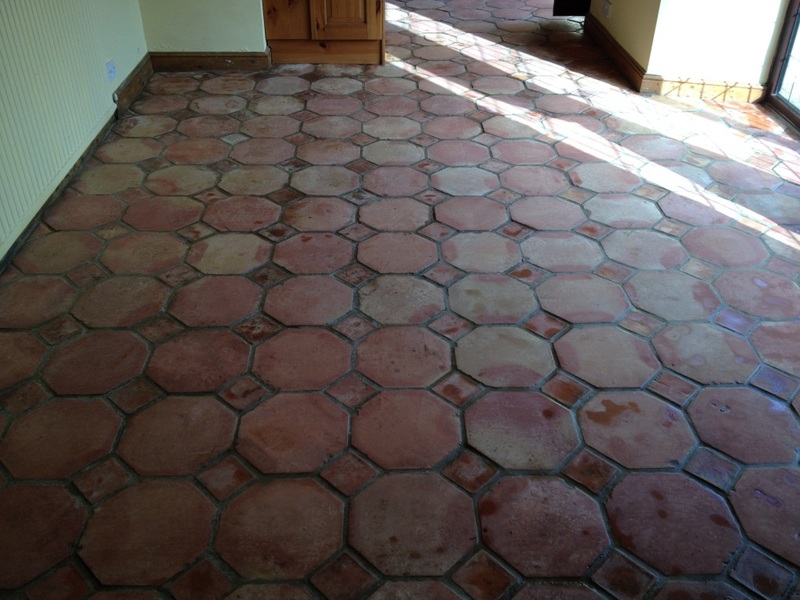 As you can see from the before and after photographs, a remarkable difference was made to the condition and appearance of this Terracotta tiled floor. 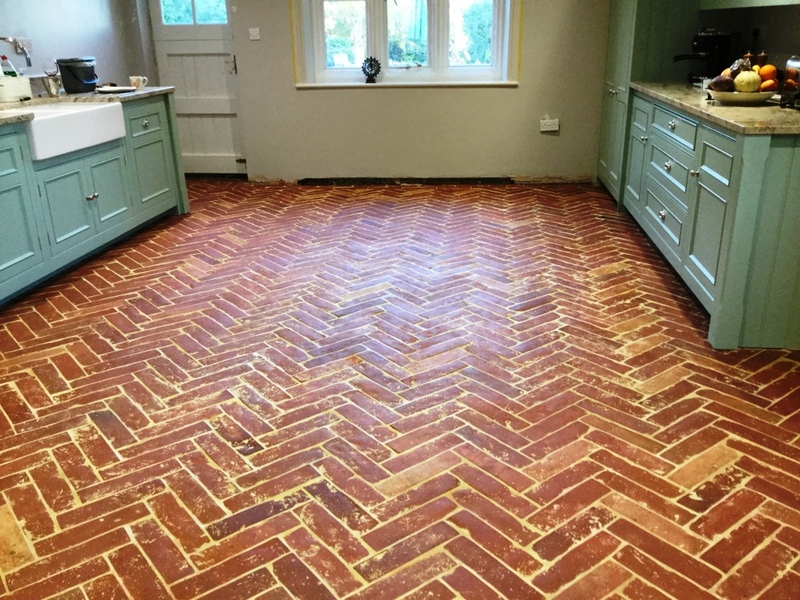 My customer was very pleased with the results, and I’m sure the new home owner will be even more pleased to find the floor looking great when they move in. 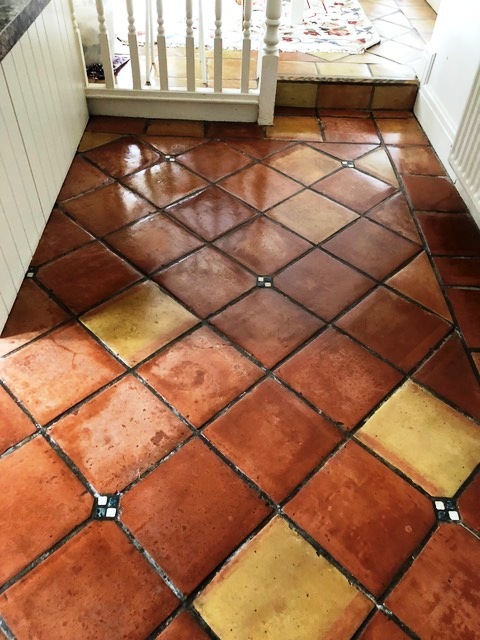 Sealers really do bring out the best in Terracotta tiles, however the catch is they will wear off over time and if you want to maintain that appearance you have to work out a regular maintenance plan. 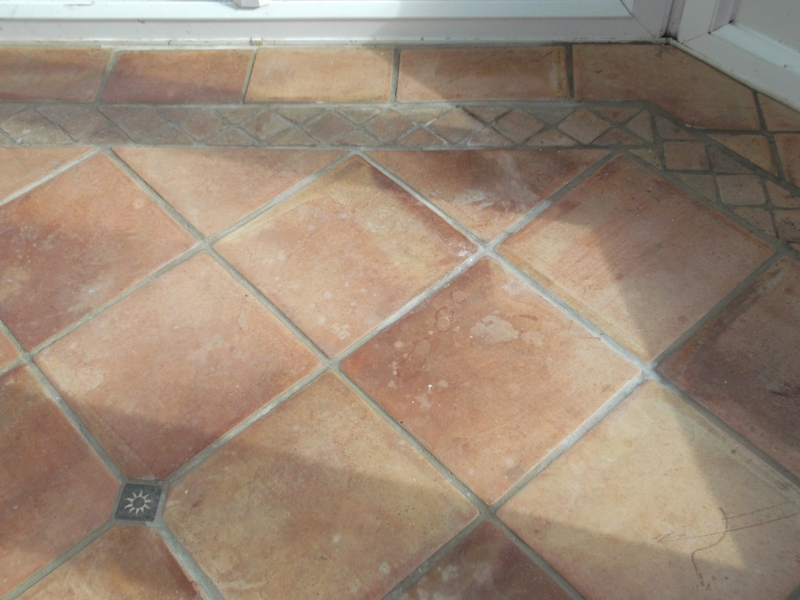 If you don’t maintain the sealer you will find that the sealer near the most heavily used areas such as doors etc. 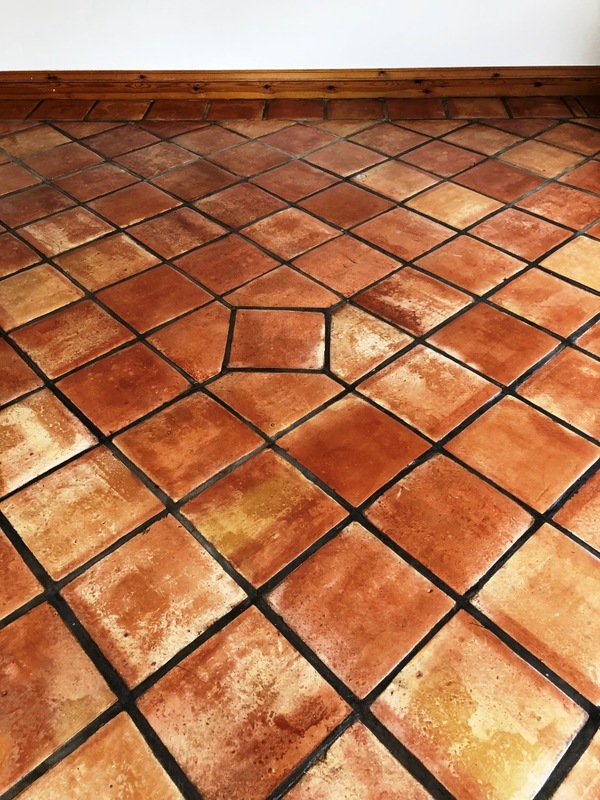 will wear away first and once that happens dirt will become ingrained in the tile and becomes difficult to clean resulting in a patchy appearance. 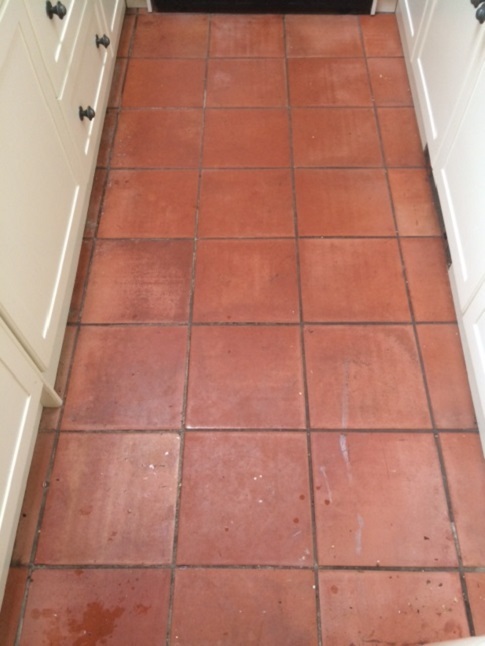 The remaining sealer on this Terracotta tiled kitchen floor at a house in the town of Wickford, Essex was no longer effective and had worn completely off in places. 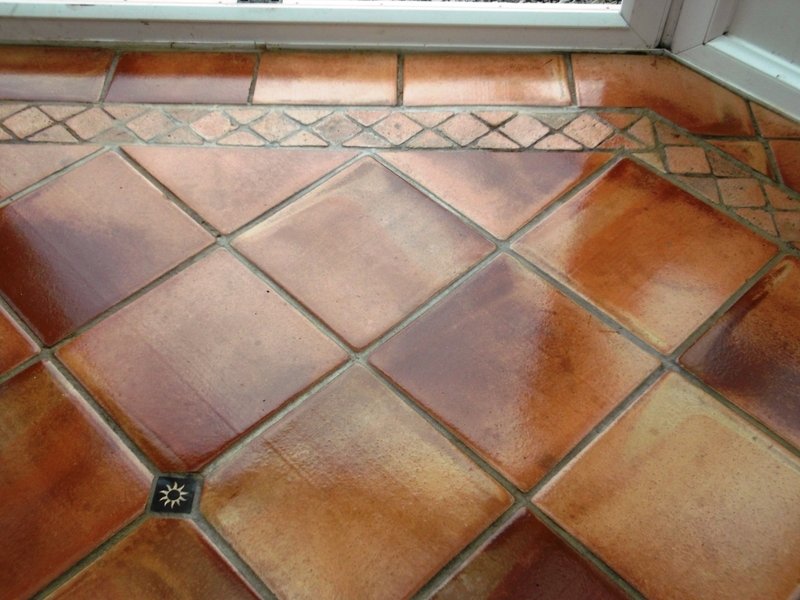 The solution was to strip off the old sealer, clean the Terracotta tile and gout and then re-seal with a fresh seal. 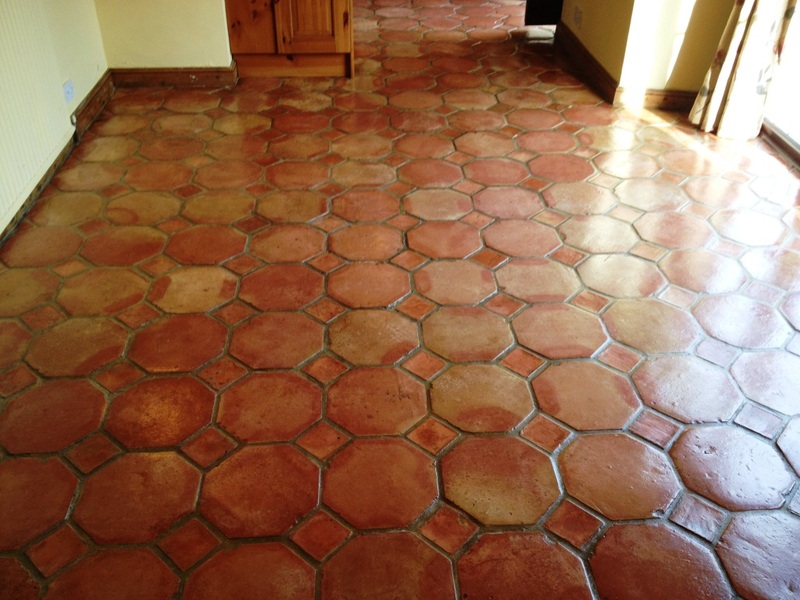 I started by giving the floor a deep clean with Tile Doctor Pro Clean diluted 2 parts water to 1 part cleaner. This is quite a strong dilution designed to allow the removal of the sealer and was left to dwell on the floor for ten minutes before working it into the floor using a scrubbing machine fitted with a black pad. Surprisingly the sealer was proving difficult to shift in certain areas and I had to repeat the process a few times and made sure to give the grout a good scrubbing as well. 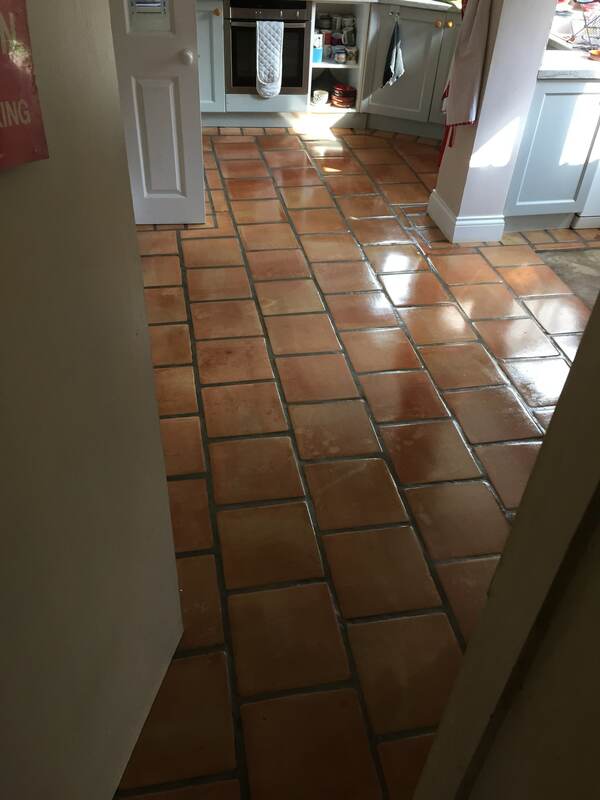 I managed to get rid of most of the sealer using this process and for the remaining stubborn areas I used a stronger product called Tile Doctor Remove and Go which is a very effective coatings remover that is safe to use on tiles. 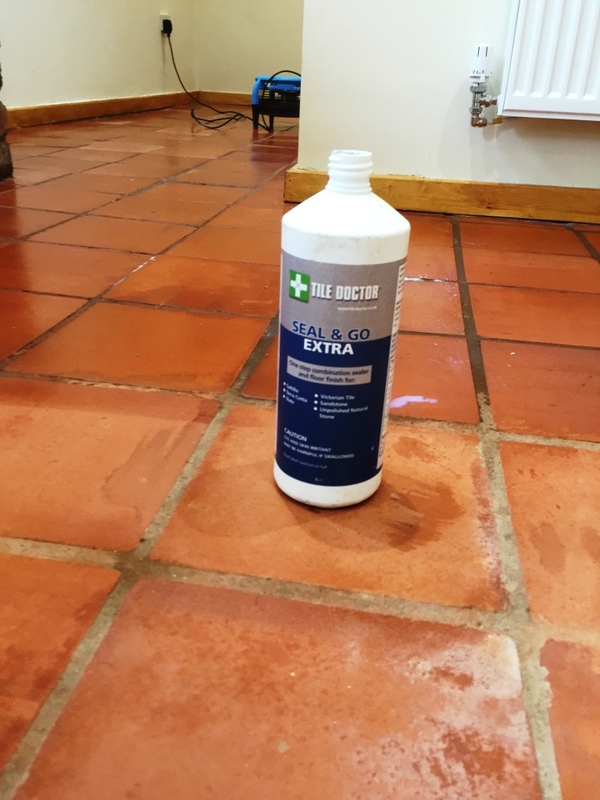 This did the trick and the floor was now free of sealers and the grout was looking much better too, the resultant slurry was removed using a wet vacuum and I then rinsed the floor several times with water before leaving it to dry for weekend. 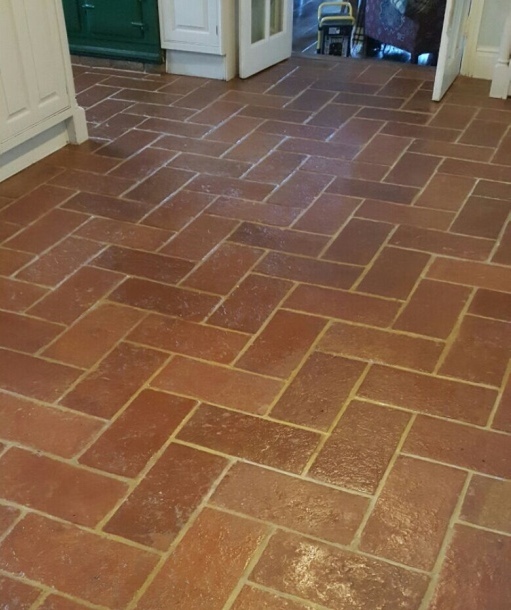 Tile Doctor Colour Grow which is an impregnating sealer that seeps into the pores of the tile to block them and prevent contaminates becoming ingrained in there and it also enhances the natural colours. 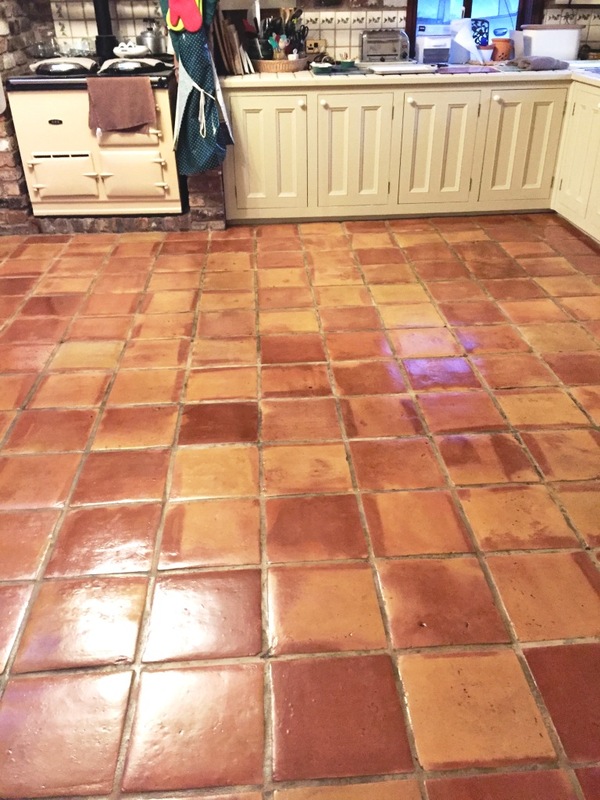 Once this was dry I followed up with a number of coats of Tile Doctor Seal and Go which is topical sealer that will protect the surface and adds a nice sheen to the floor and is a popular choice for Terracotta and Quarry tiles. 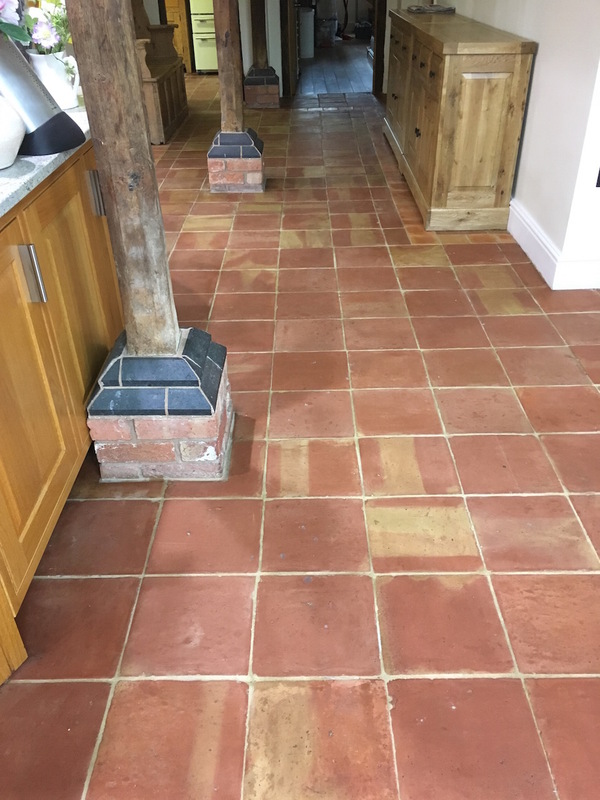 I’m not sure my photographs do this post any justice however hopefully you can see that floor was quite transformed, the grout is much cleaner and the colours in the Terracotta have really come to life. 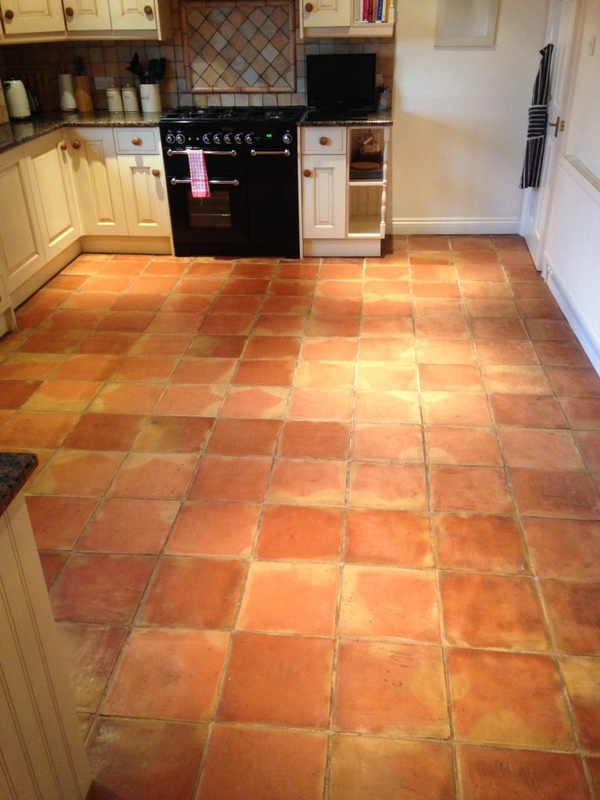 This client in the East Sussex town of Wadhurst, was selling her country cottage and wanting to achieve the best price decided to have the Terracotta tiled kitchen floor restored before she put property on the market. Personally I think this is a great idea as you want to show the house at its best; I guess Estate Agents and Sarah Beeny would call it staging the property, although she should do well as it was a lovely cottage and Wadhurst is an old, quiet market town lying on a high ridge in the area known as the Weald, between the North and South Downs and so should prove popular. 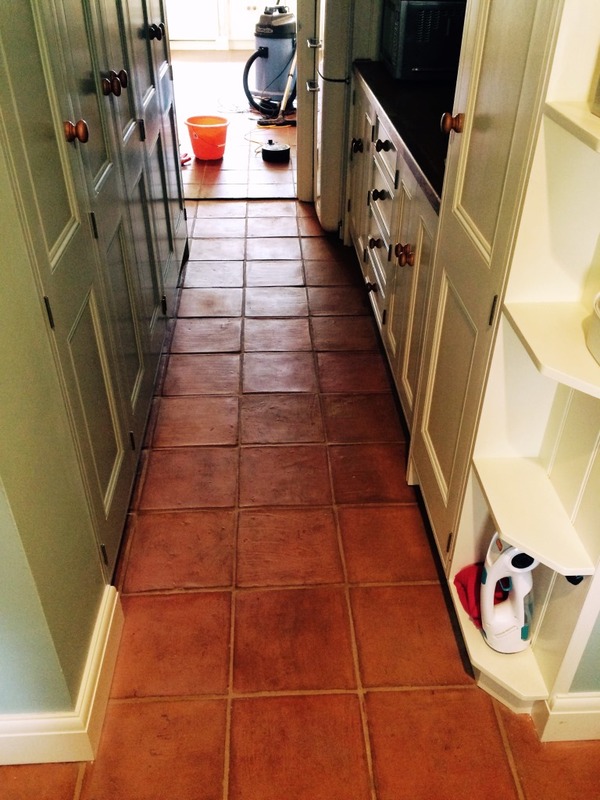 The Terracotta tiled floor was in real need of a good clean and seal which is not surprising considering that the kitchen is generally a very high traffic area in most houses and, in this case, the family Labrador loved to use it as a play area. 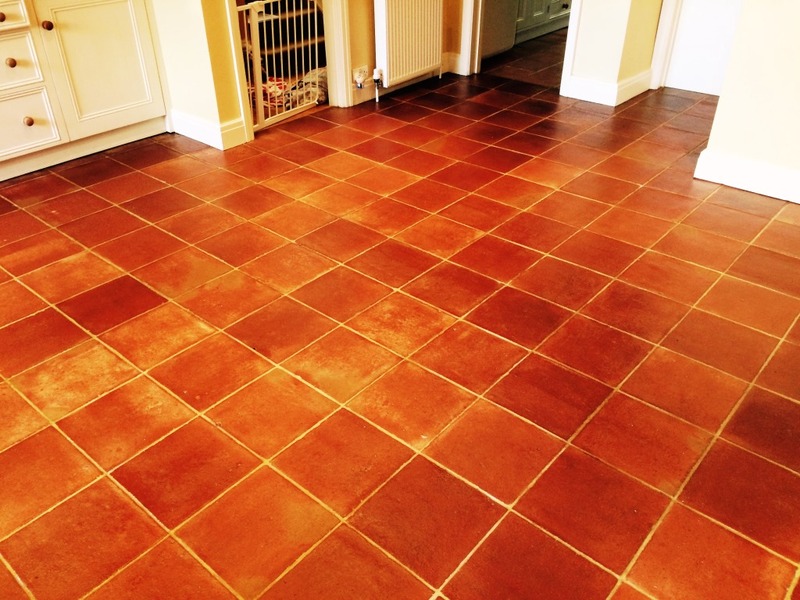 Terracotta tiles have been used for over 2000 years, having been first popularised by the ancient Romans. 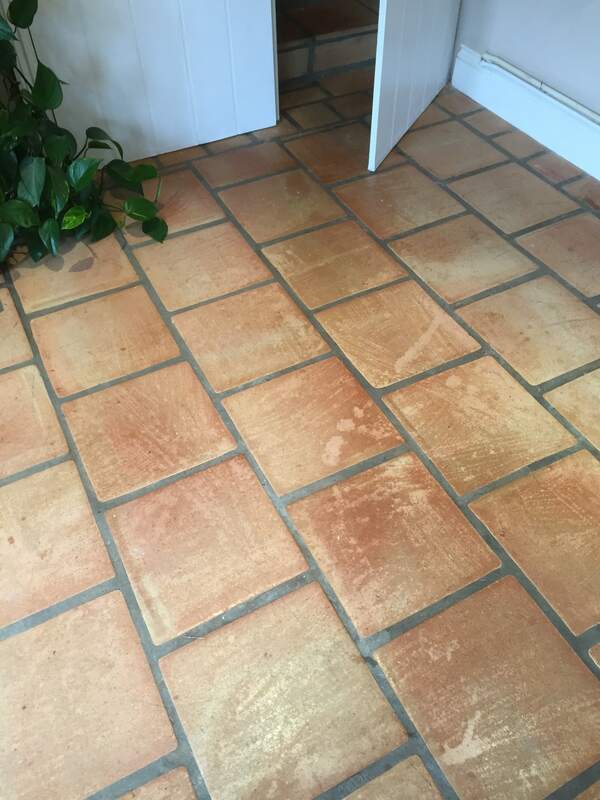 However, one downside to them is that, due to the lack of surface glaze, they can pick up dirt very quickly, which can become ingrained in the tiles if not removed quickly. 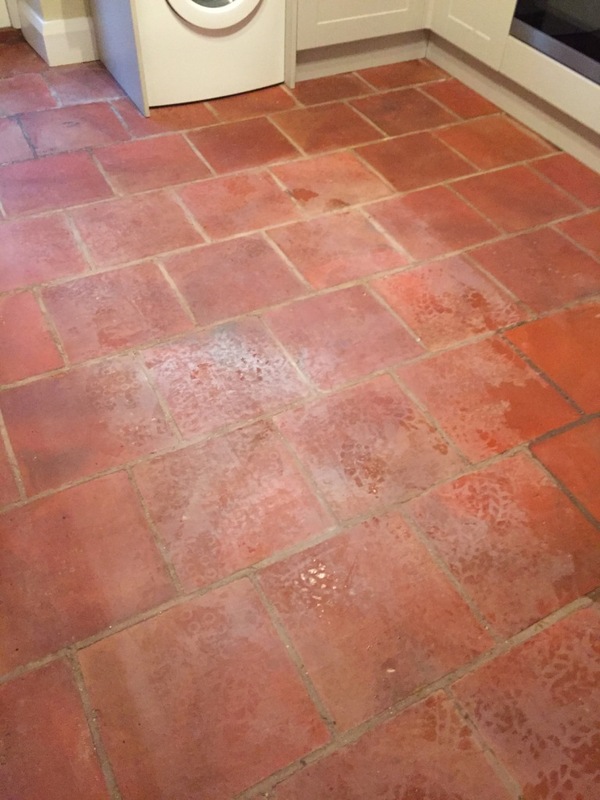 After removing the client’s Labrador from the kitchen, I set to work cleaning the floor using a strong solution of Tile Doctor Pro-Clean. I applied a layer of the solution to the floor, before leaving it for a short period to dwell and soak into the pores of the Terracotta. 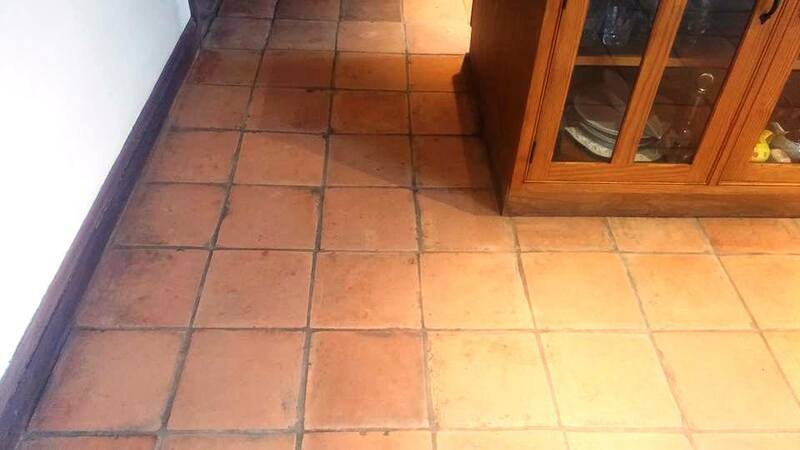 I then set to work scrubbing the cleaning solution into the tiles and, since Pro-Clean acts as both a cleaner and a stripper, the any remaining old sealer quickly came off. 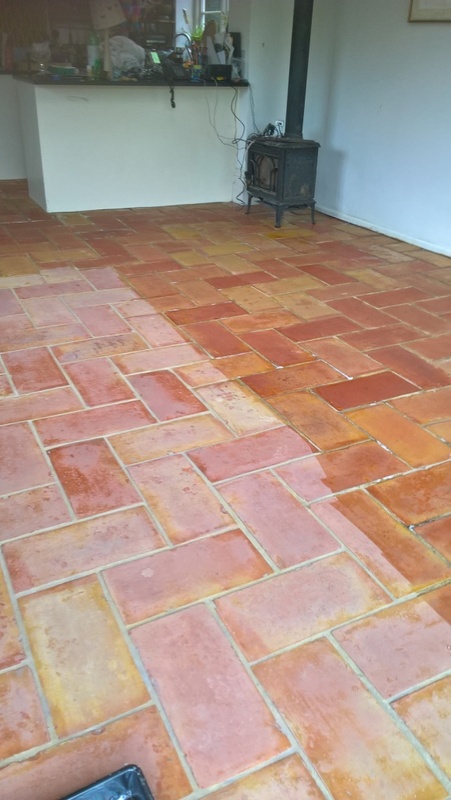 The Pro-Clean successfully lifted the ingrained dirt out of the tiles leaving the colourful terracotta looking much cleaner. 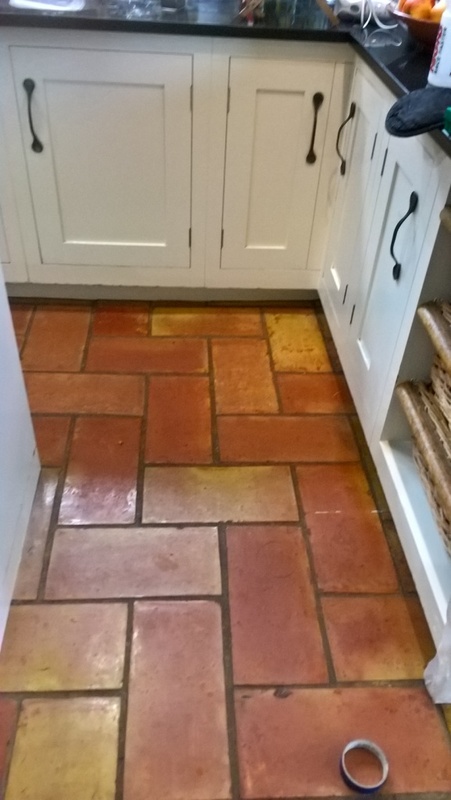 It also had a dramatic effect on the colour of the grout, transforming it from a mucky shade of tan to cleaner looking yellow. After cleaning and a thorough rinse, I left the floor to dry over the weekend, but not before instructing the client to keep the dog out of the kitchen during this time. 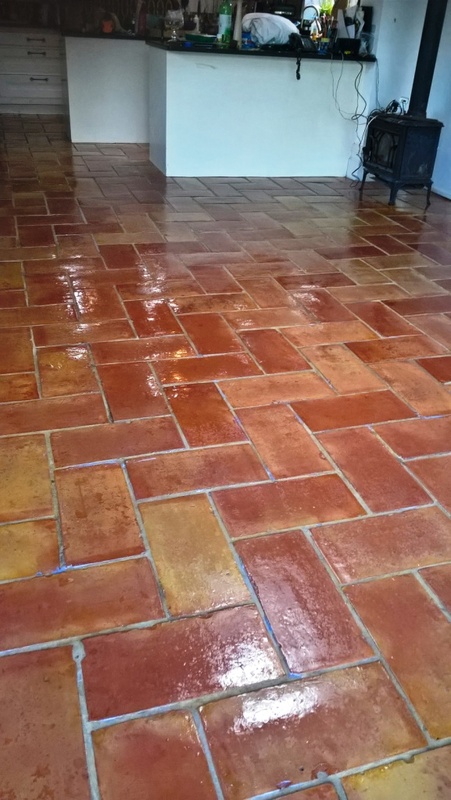 It was important to allow the floor sufficient time to dry completely, as any excess moisture left over from cleaning could affect the performance of the sealer. 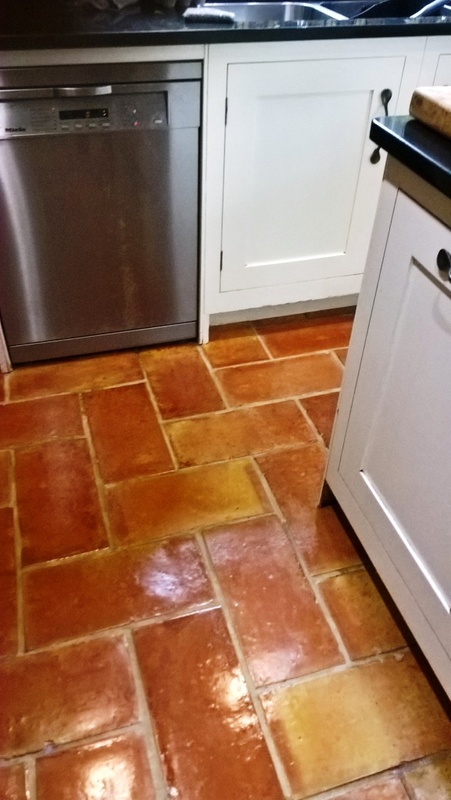 My sealer of choice was Tile Doctor Seal & Go, which I applied to the floor to provide it with not only a nice low-sheen finish, but also a stain resistant surface seal that will protect the tiles against dirt in the long-term. 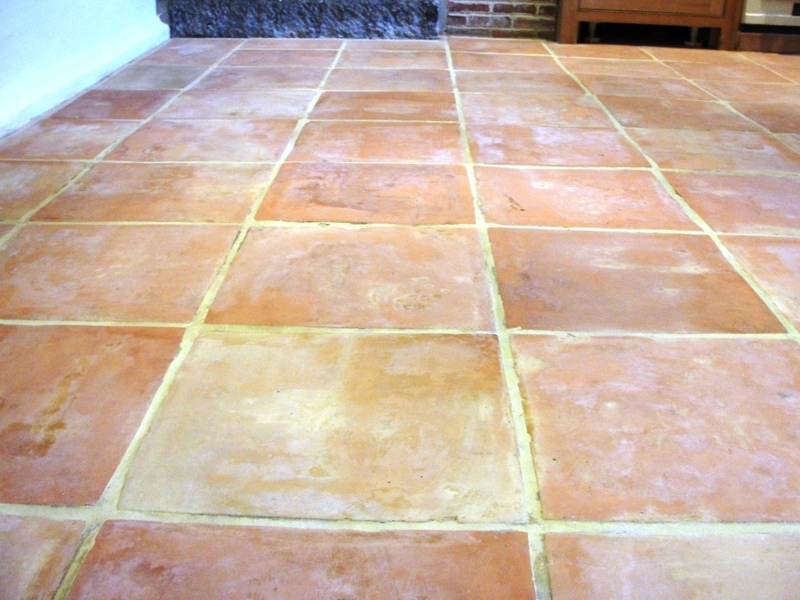 Seal & Go is a suitable sealer for unsealed porous surfaces like Terracotta, Victorian tile, textured Quarry and Slate. 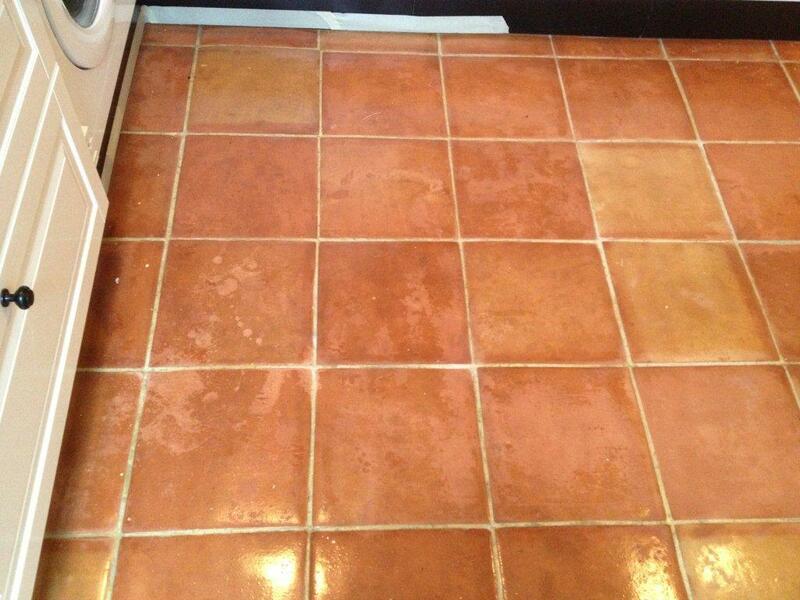 My client was very pleased with the results of the clean and seal, and so was I. 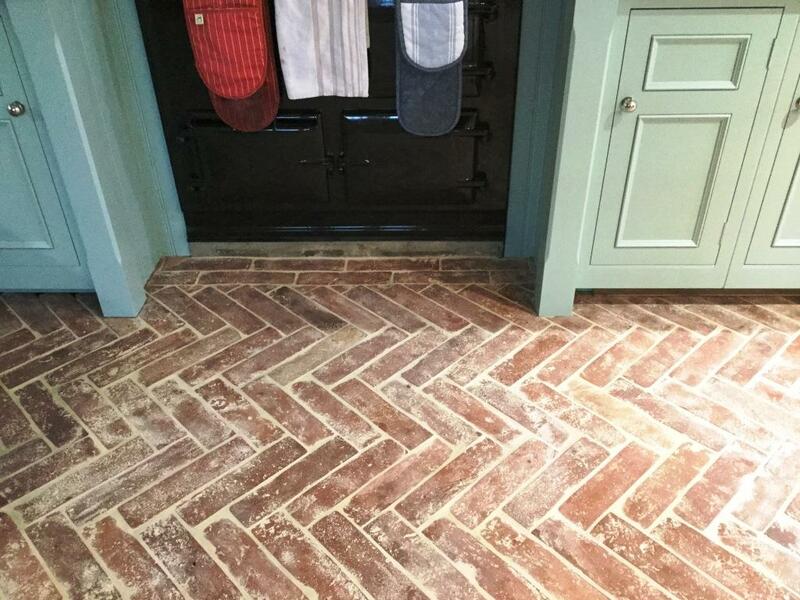 The Terracotta tiled floor in the kitchen of her house is a fantastic feature, and I’m sure whoever buys the country cottage will love it as well. 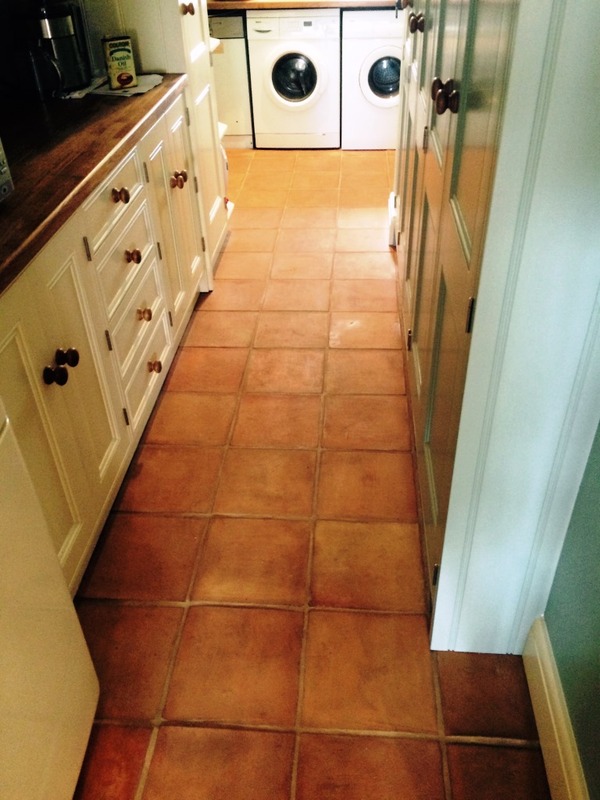 This customer in Henfield was contemplating digging up her Terracotta kitchen floor and replacing it, the tiles were ingrained with dirt which had proved impossible to remove and as a consequence were left looking flat, dull and very un-appealing. Additionally she had an elderly dog that had been ill several times in the corner area and she really struggled to make it look decent again. Following a quick test I was able to persuade her to try a clean and re-seal first. 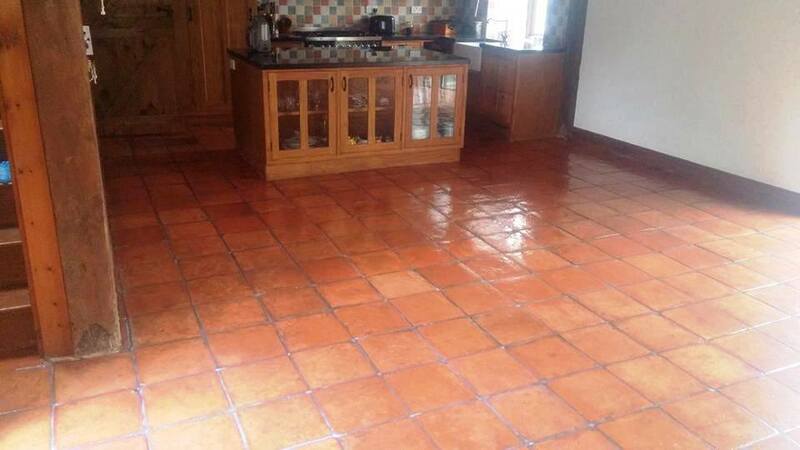 The first step was to deep clean the floor to remove the ingrained dirt and any previous sealers. As well as the dog I had two rugby playing sons to deal with so to make it easier for the family I split the floor up into areas and worked on one area at a time. 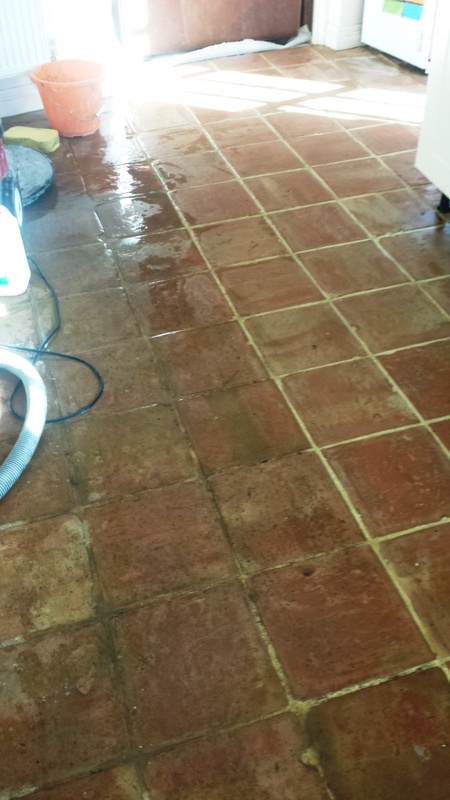 The tiles were first soaked in a strong solution of Tile Doctor Pro-Clean before scrubbing it into the tile and grout with a black pad fitted to a buffing machine. 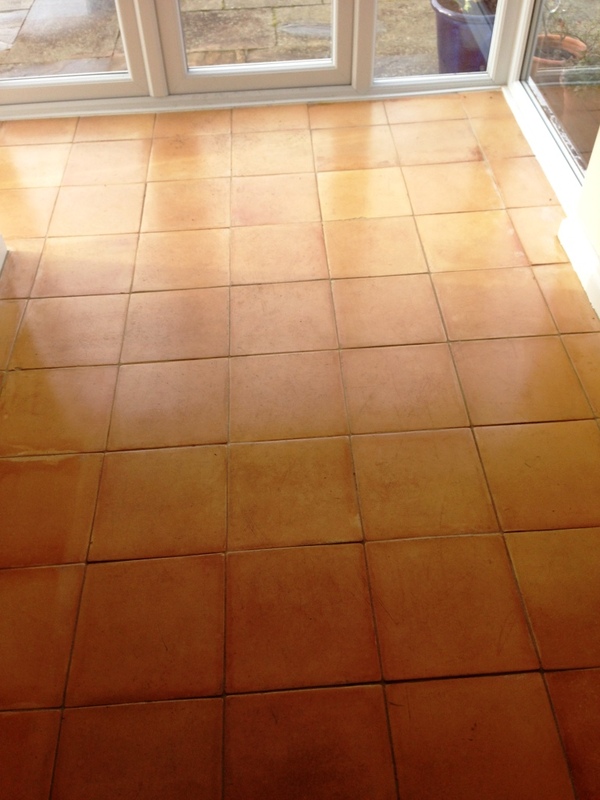 The tiles were rinsed, the now dirty cleaning solution extracted and the process repeated until I was happy that the Pro-Clean had done its trick and the floor was as clean as it could be. 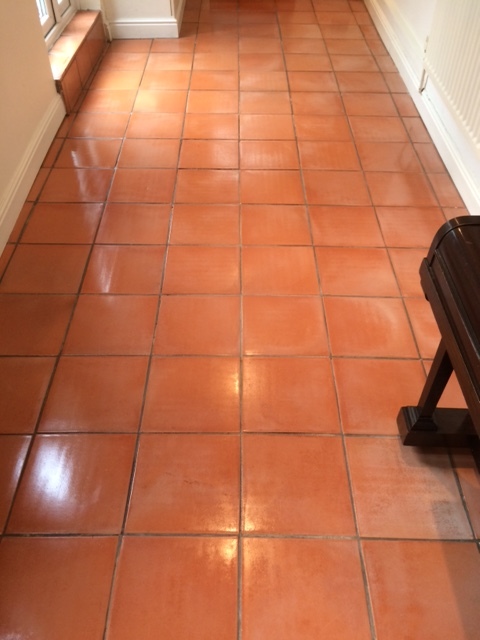 The Terracotta tiles now looked clean but completely washed out so I assured the customer that once the tiles had been sealed the colour would return and more. 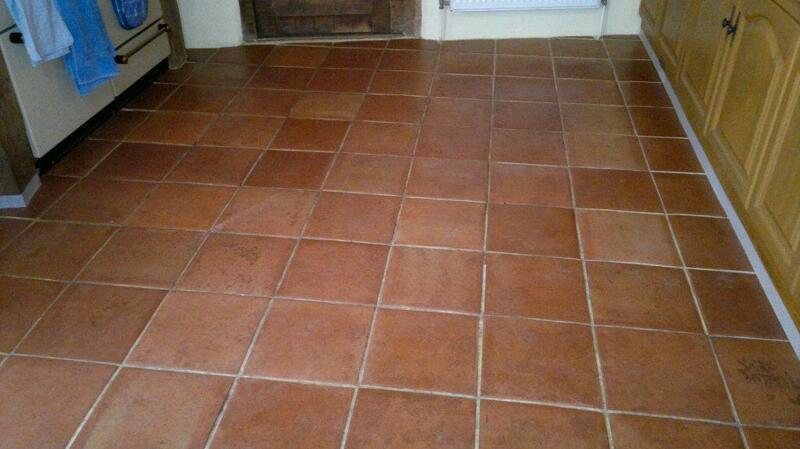 Unsealed Terracotta marks easily so given I left the customer dust sheets to walk on. 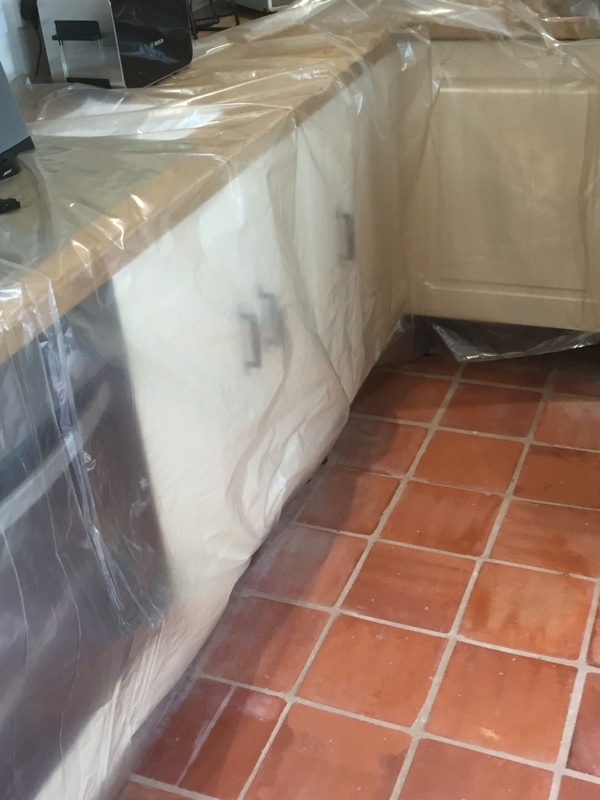 I returned after two days to ensure any moisture had left the tile and proceeded to seal with six coats of Tile Doctor Pro-Seal which is highly recommended for use in food preparation areas and gives a high gloss finish whilst providing maximum stain protection. As each coat takes 40 minutes to dry I took the opportunity to clean her slate front door step as well. The customer was very happy with the finished floor and I’m glad to report she has decided to keep the floor. 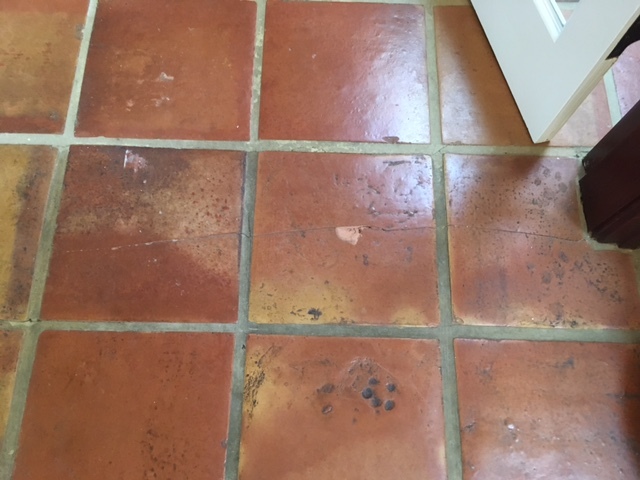 This was a rather dirty Terracotta kitchen floor located at a house in Winchmore Hill in Buckinghamshire, not to be confused with the Winchmore Hill in London. 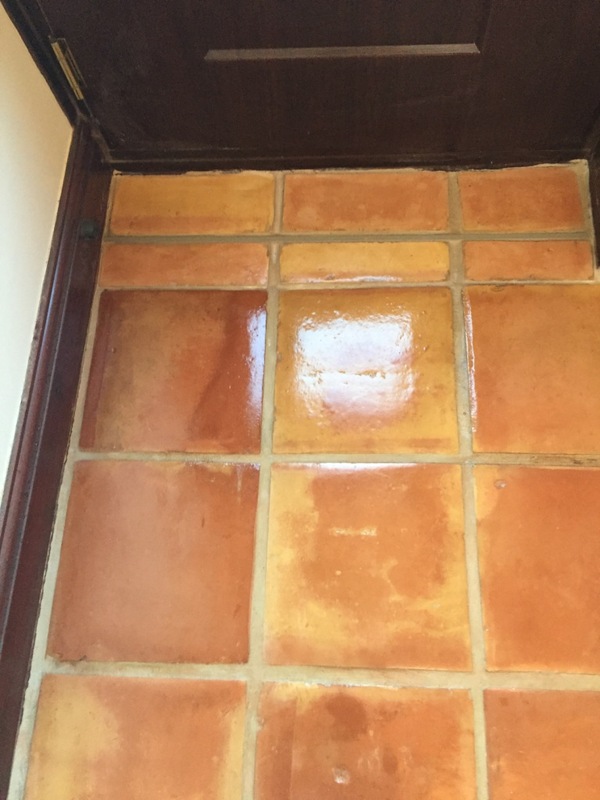 The sealer on the tiles had worn off some time ago and now the dirt was becoming trapped in the pores of the Terracotta making it impossible to clean. 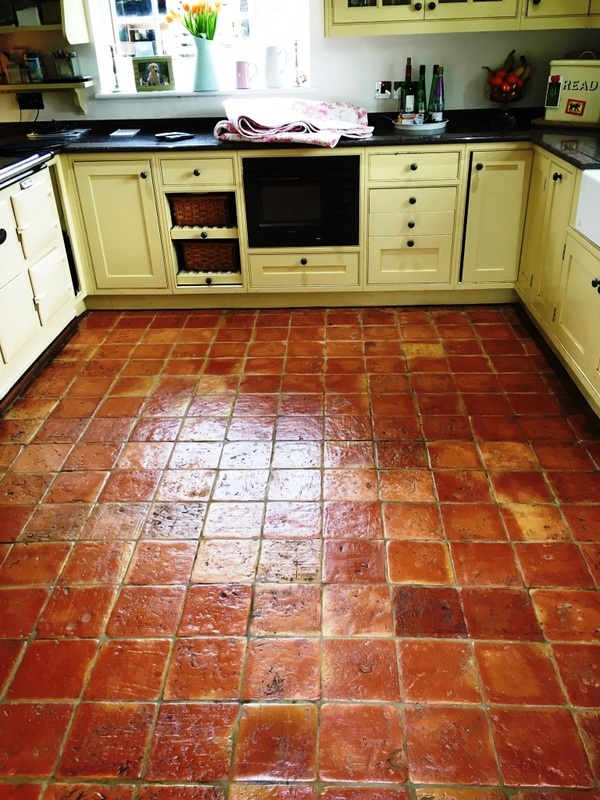 To deep clean into the pores of the Terracotta a diluted solution of Tile Doctor Pro Clean, which is a strong tile cleaner sage to use on tiled floors, was applied to kitchen floor and left to soak in for around ten minutes. 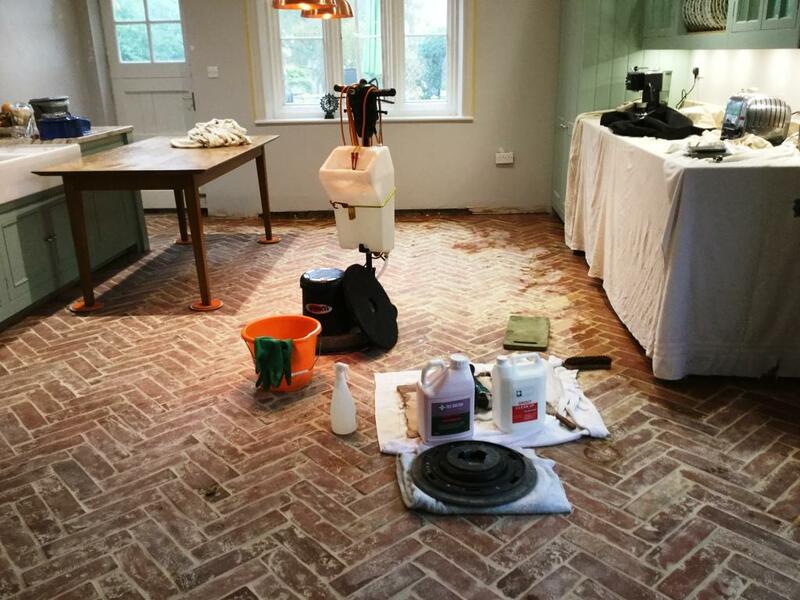 Then with the aid of a commercial rotary machine the solution was scrubbed into the tiles to release the many years of accumulated ingrained soiling which was removed from the floor using a wet vacuum. 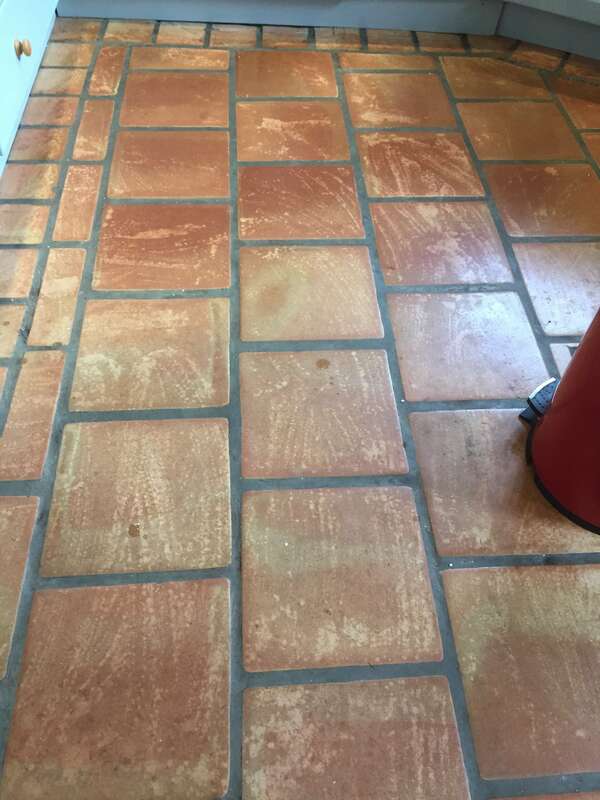 Although this deep cleaned the tile the grout lines needed further attention and were treated with Tile Doctor Grout Clean-up solution and then washed down with fresh water which was removed with a wet vacuum. The next day came back to do the sealing and checked the floor first for any spots we might had missed and also to ensure it had dried sufficiently. 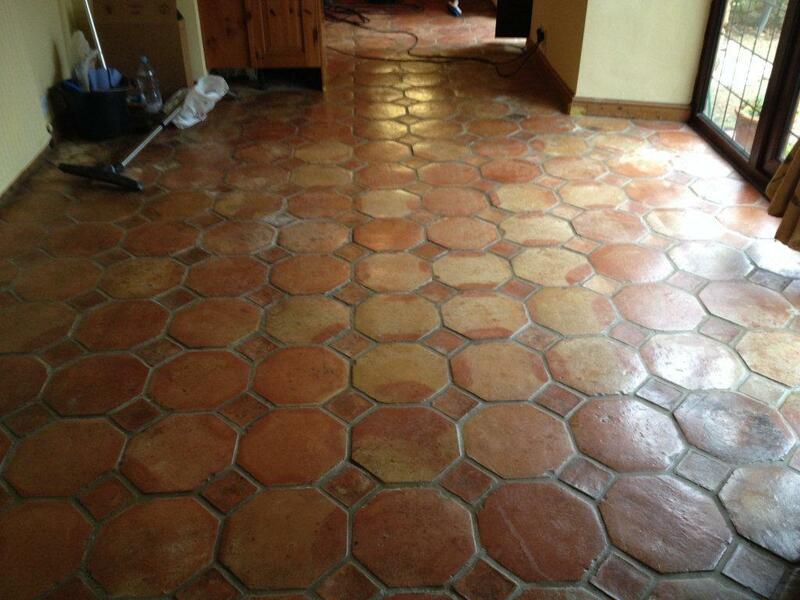 Tile Doctor Seal and Go was then applied in coats to fully seal the floor. As well as adding protection Seal and Go adds a nice subtle satin finish to Terracotta and being water based it doesn’t give off an odour when it’s drying. 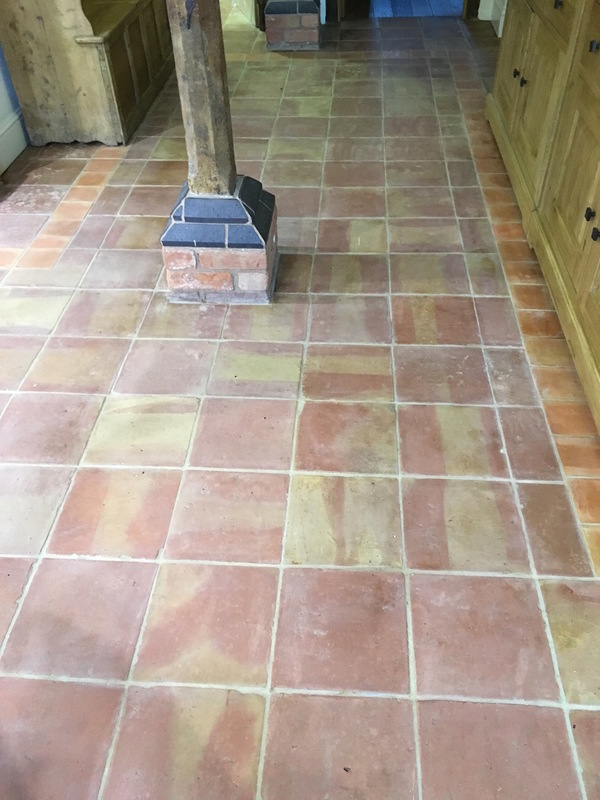 Photographs below of a Terracotta tiled kitchen floor installed in the kitchen of a residence in the market town of Brackley, Buckinghamshire. 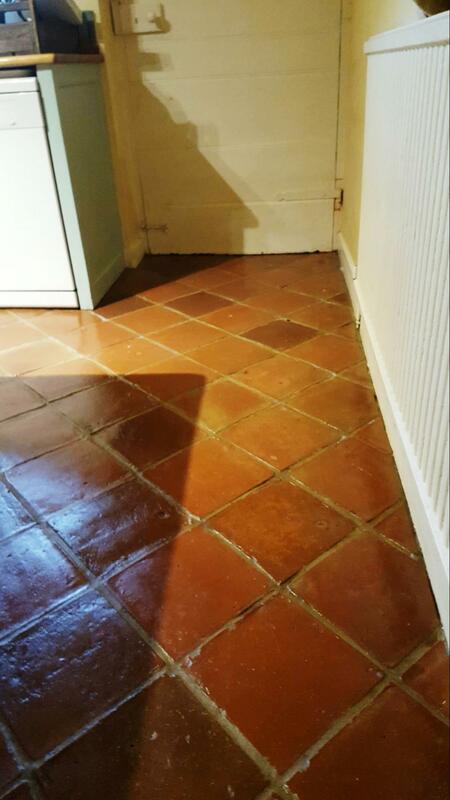 The tiles had gone dark with years of soil trapped into the pores of the Terracotta and the while the grout had become heavily stained. 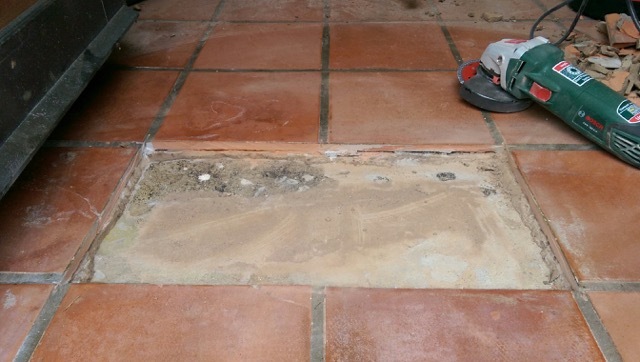 It had clearly been sometime since the floor had been deep cleaned and to get the dirt out of the tile I could see it was going to take quite a bit of work. 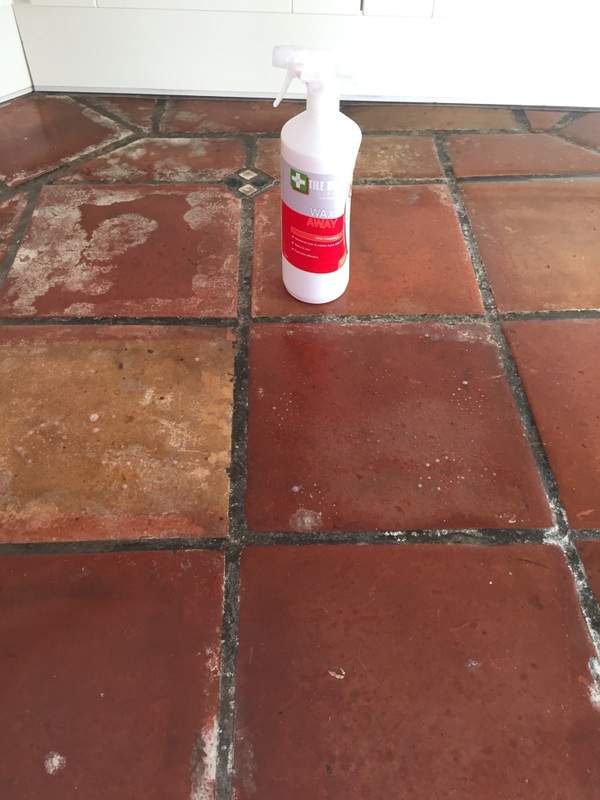 I set about applying a strong dilution of Tile Doctor Pro-Clean which is an industrial strength alkaline cleaning product that’s safe to use on tile and stone and mopped it onto the floor. The solution was left it to dwell on the floor for twenty minutes in order for it to soak into the tile and get to work on the dirt. It was then worked into the floor using a rotary machine fitted with a black scrubbing pad and stiff hand brushes were along the grout lines. 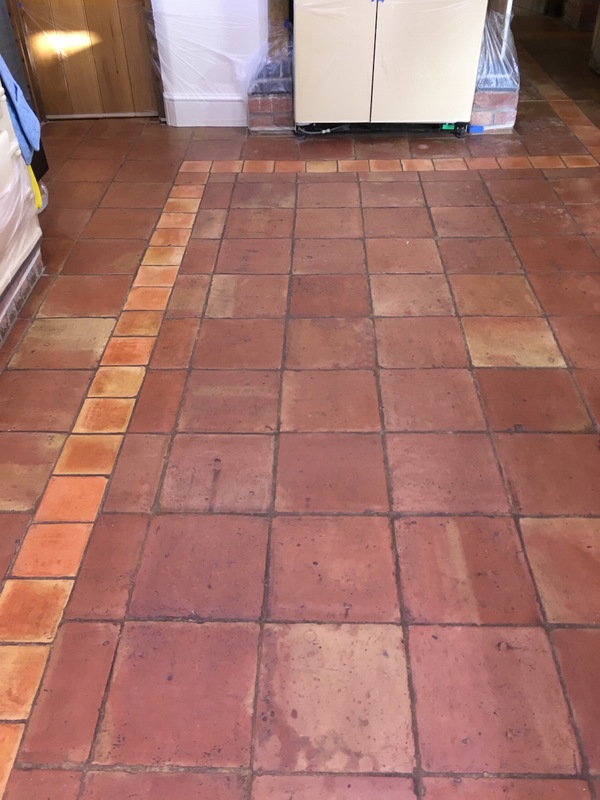 The now dirty cleaning solution was extracted from the floor using a wet and dry vacuum and the floor was then rinsed with clean water to neutralise the tile and allow us to see the result. 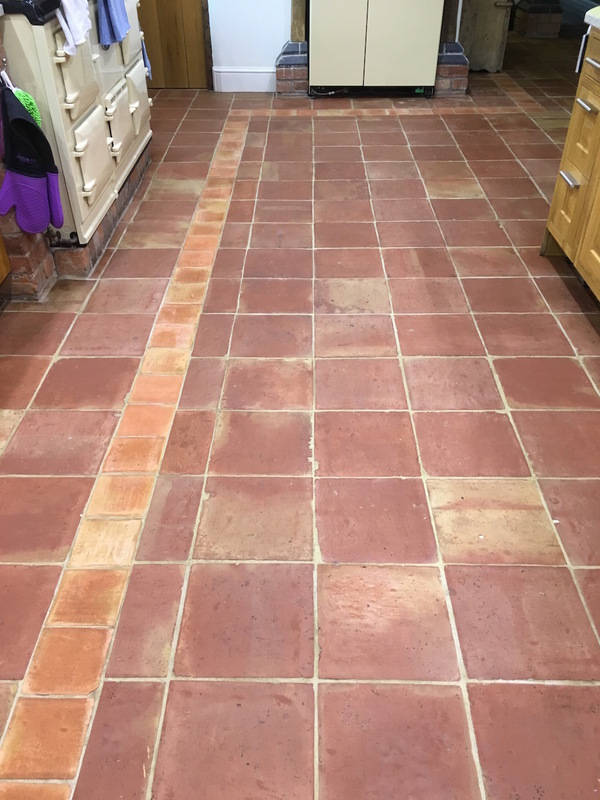 More work was required and the process was continually repeated until I was happy that any old sealer and all the dirt had been removed and then the floor was given a final rinse, wet vacuum and then left to dry overnight ready for sealing the next day. 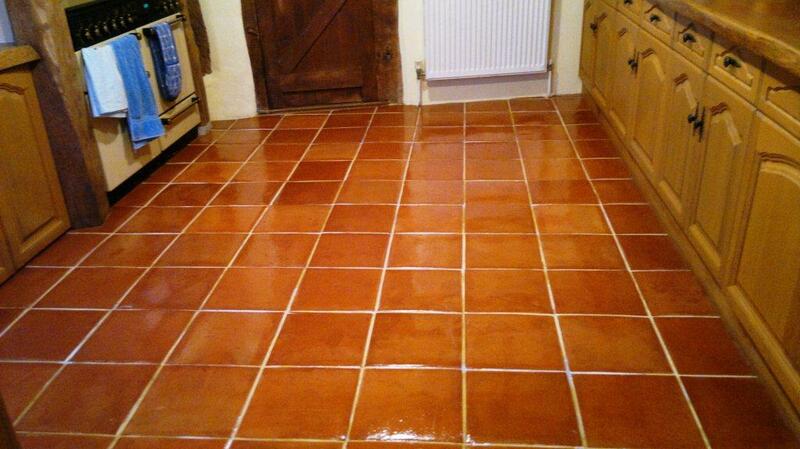 I returned the next day to seal the floor checking first that the tiles had dried out sufficiently for sealing. 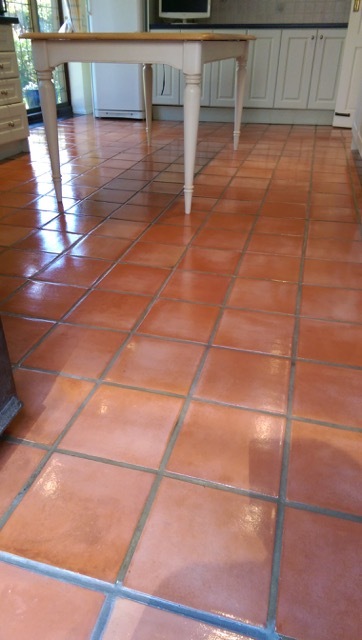 All was well so I started sealing the Terracotta tiles with seven coats of Tile Doctor Seal and Go which will protect the tiles from staining and also adds a nice subtle shine to the floor. 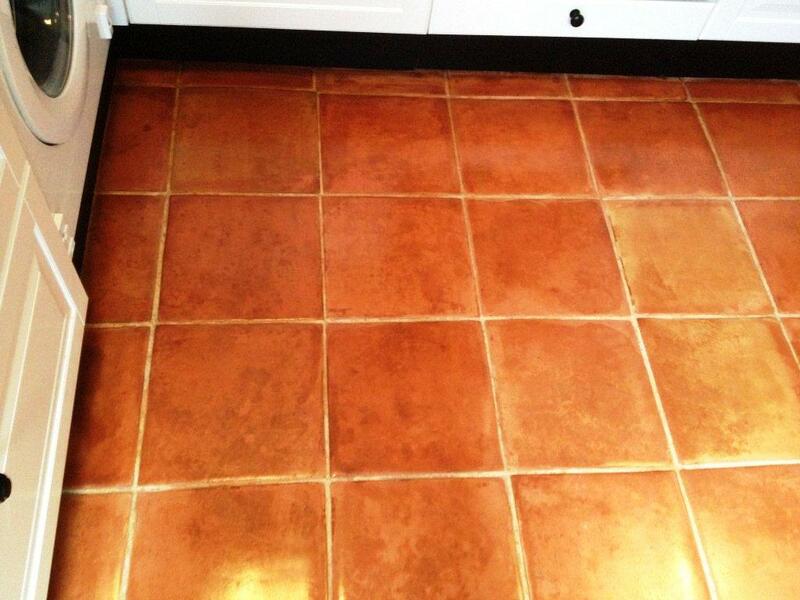 Terracotta is a clay based product and so naturally quite porous.